I’m excited to show it at guild tonight – and to publish the pattern to this in the next few days! 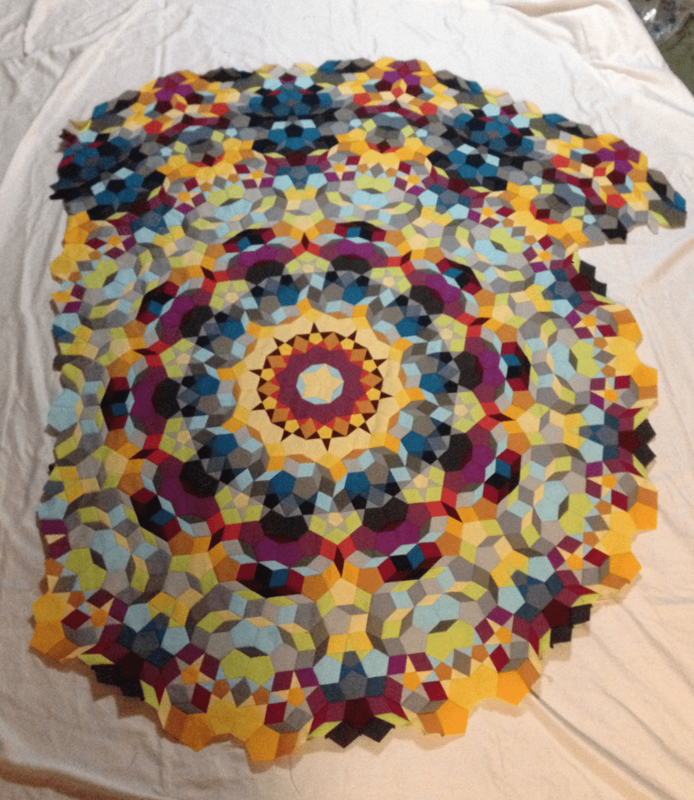 More to come as I figure out how I’m going to quilt it, or have it quilted – just wanted to share the finished top!! 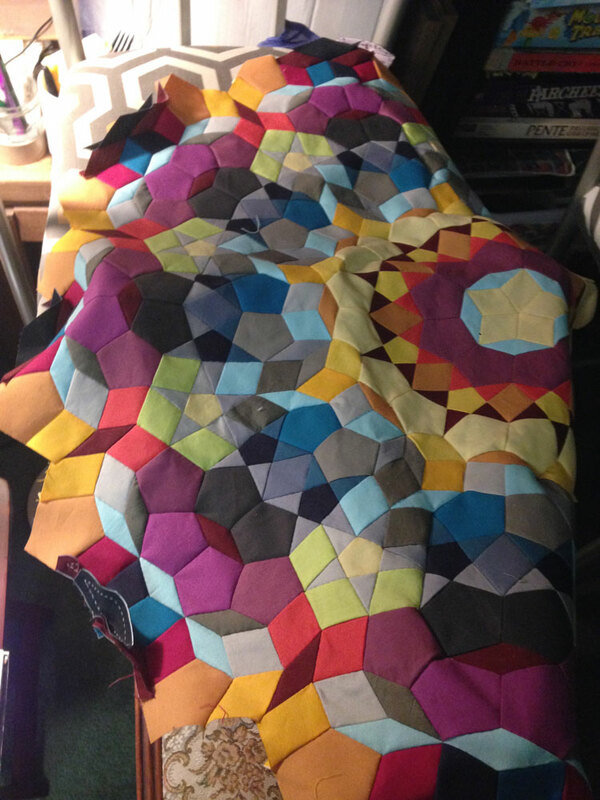 I have kept pretty good track of my actual time spent sewing the Kaleidoscope Quilt together. It was very accurate time-keeping for the most part. I used the timer on my phone and would deduct for bathroom breaks and any other time I stopped sewing for a while. 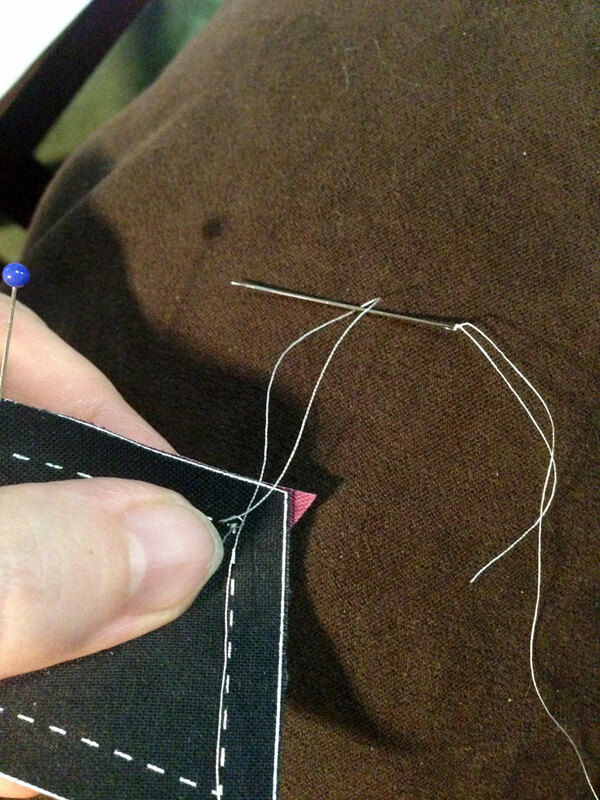 This is stitching time only. The design, layout, printing of pieces and cutting them to size were not figured into this time. Yes!! We screen printed the pieces on the back to show the stitch and cut lines for each piece… I call them NEPP Kits and Pieces for NOT English Paper Pieced. 28,738 minutes = 478.9 hours = Approx. 3 months at full time (40hrs/week). 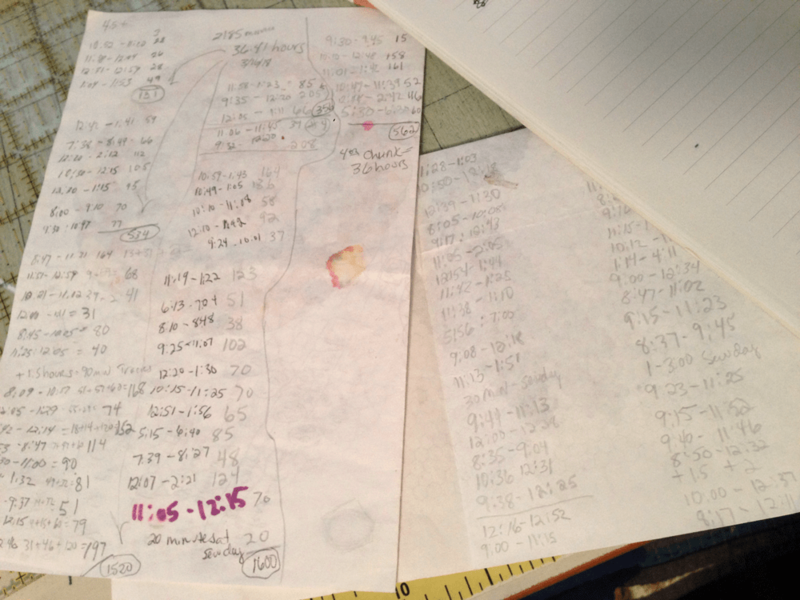 Have you ever kept track of your time when sewing? I highly recommend trying it. It really helps to value your quilting work properly!! Plus, when people ask how long it took, you can answer confidently! 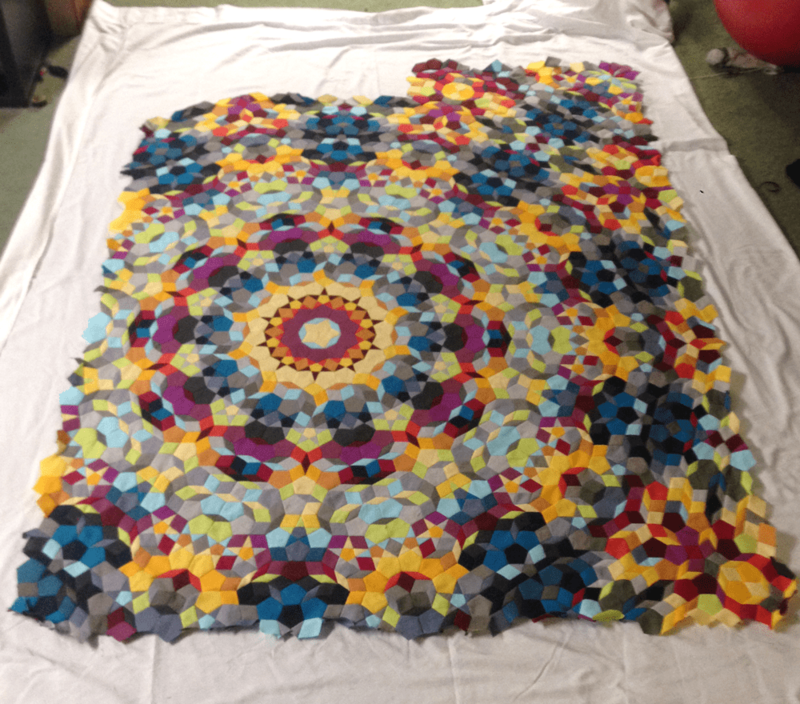 When I get a good photo of the fully completed top, I will post… for now here it is: almost done! 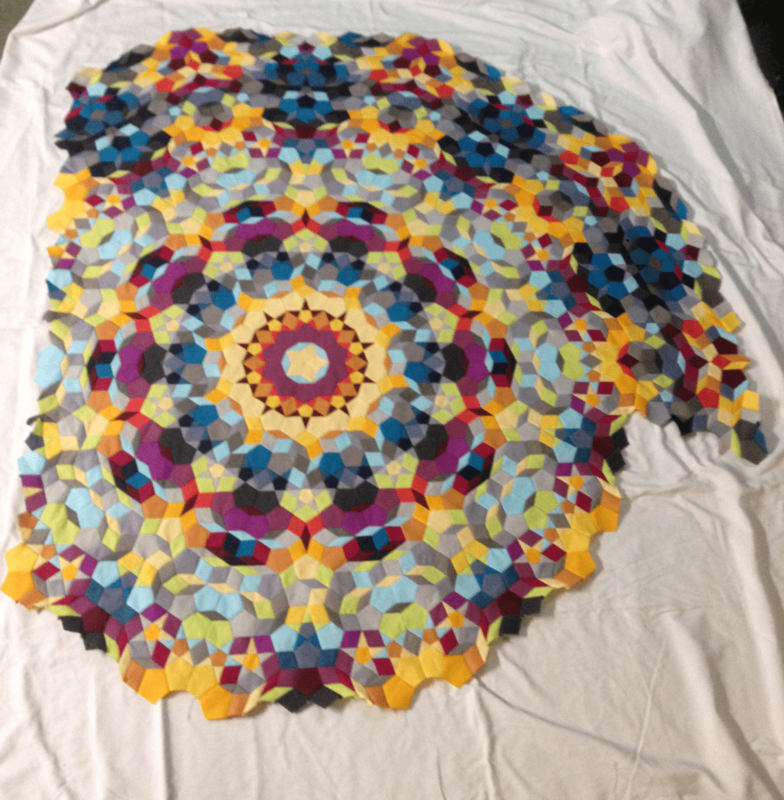 I’m so excited right now… I finished all the smaller chunks of my Kaleidoscope Quilt, and I’ve started sewing them onto the center piece of the quilt. It’s going much fast than anticipated and it’s making it really fun! 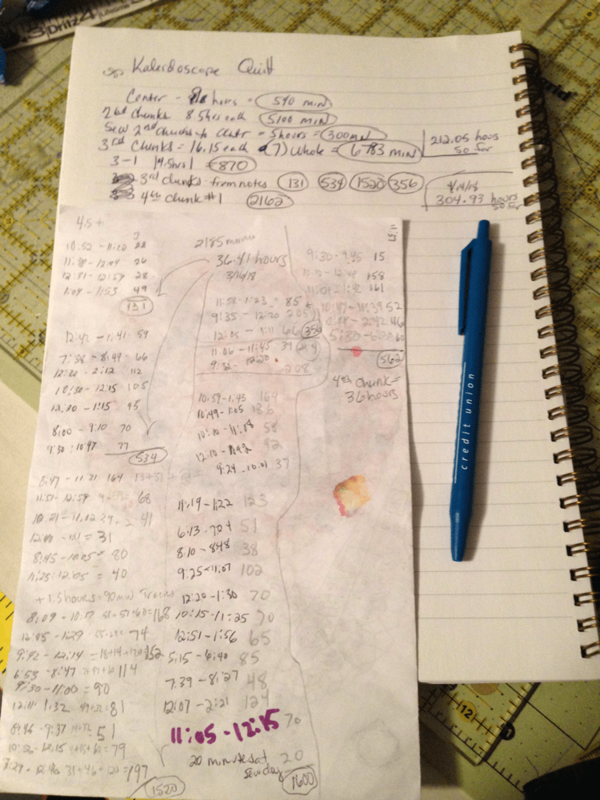 As you can see, I have added 4 outer chunks out of the remaining 15… so only 9 left. 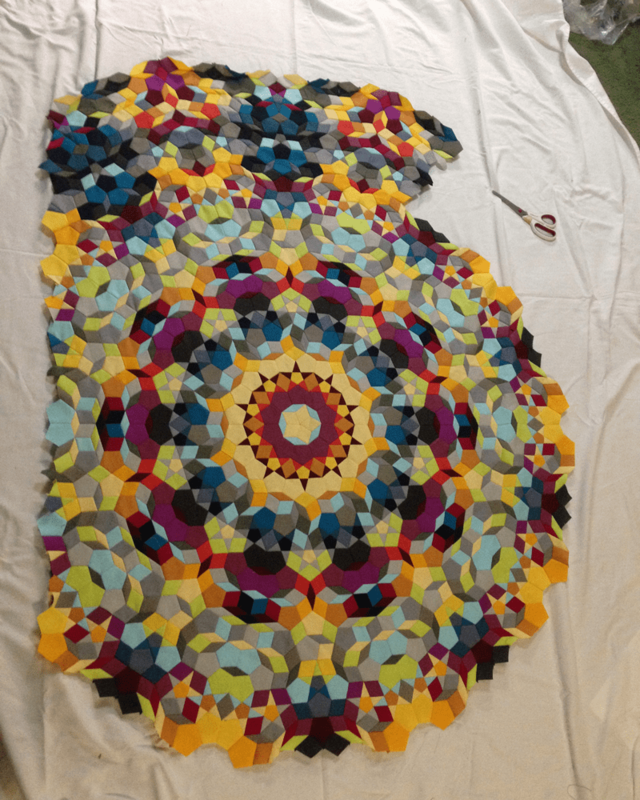 I’m pretty sure I’ll be bringing the finished top to the next PMQG meeting in August – if you belong to our guild and will be at the meeting, you can see all the stitching on the back before I get it quilted. 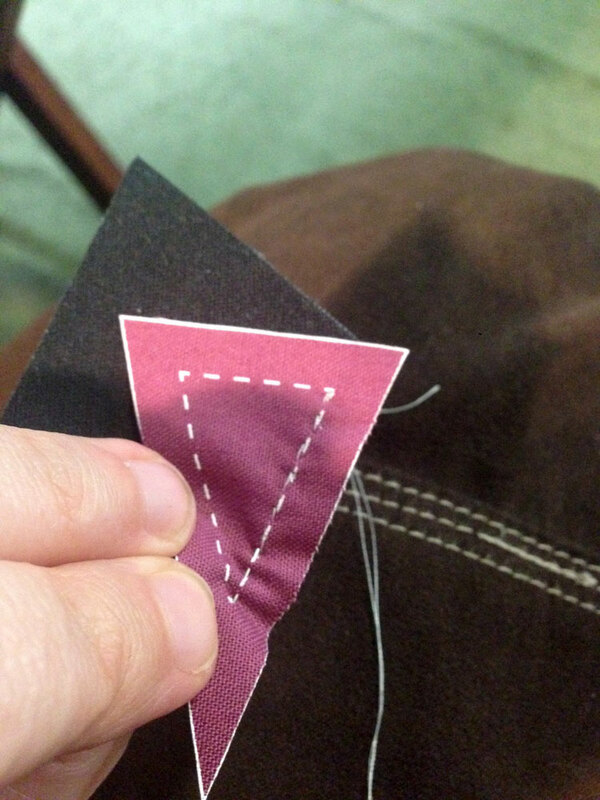 I have kits and pieces of these fabric shapes in our store, if you’re interested in trying straight stitching hand work. I really like it. Here’s a link to check out. 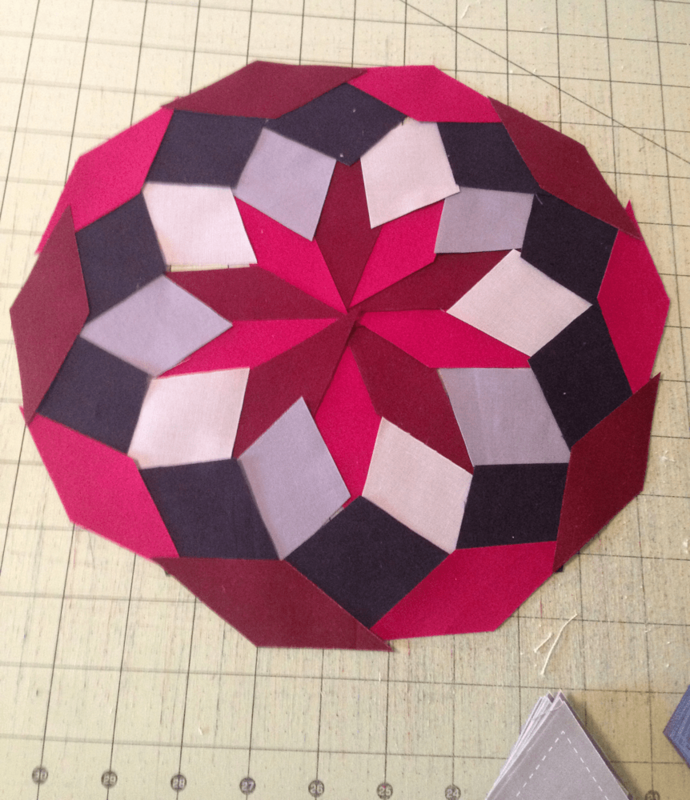 Still not sure what I’m going to do for quilting… I have a couple options, but still am unsure. I’m very happy to see an end in sight for this project. Pretty soon I can really focus on my Vishuddha Quilt. I’ve realized I can only really work on one project at a time. I’ve been pushing through life lately. I’m sure you can relate. I’m working on my emotional issues and that has been draining. I just keep going back to sewing when I start to spin out mentally. – Do you know that feeling? When there is so much going on AND so much to do, you start to go from one idea to another – not giving anything the needed time and attention it deserves… not getting anything done…? I call it spinning out. 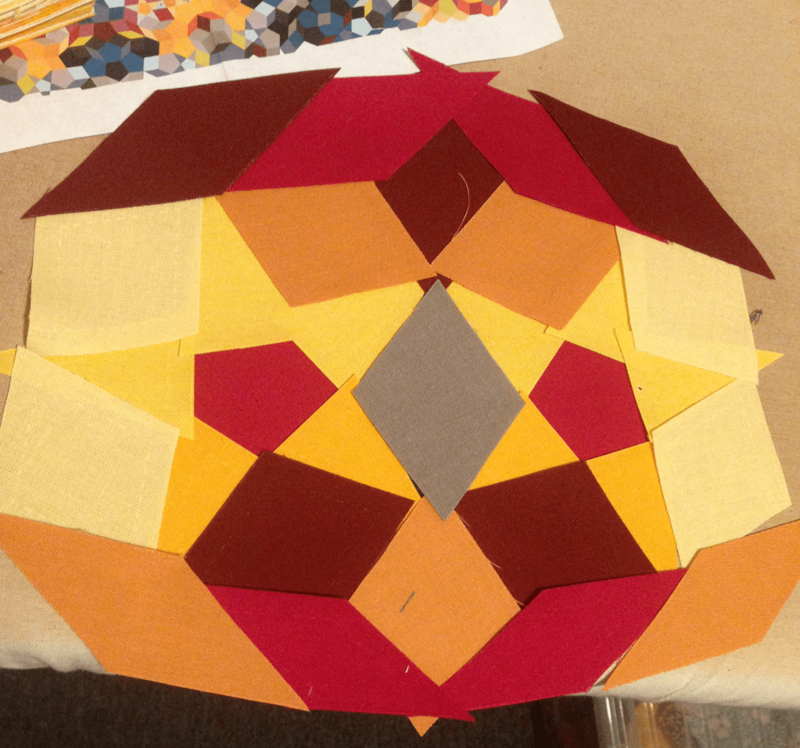 But – I have been working on my Kaleidoscope Quilt and it is coming along very nicely. I only have 3 chunks left in the whole quilt! SQUEEE! Then I need to sew these larger chunks onto my centerpiece, so I still have a bit to do, BUT I think I’ll be able to finish the top to show it at Show and Tell at PMQG in August! If so, that will mean I hand stitched a 60″x80″ quilt in 10 months. NOT BAD! 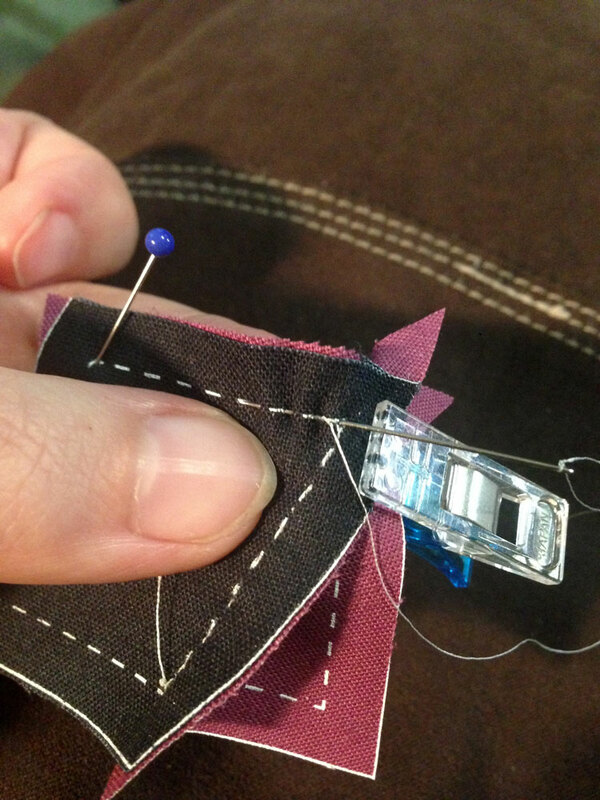 The time saved is all because of the stitch lines on the back – not having to use paper pieces saves so much time! If you’re interested in trying them, we have some in stock in our store here. I call them NEPP pieces or Not English Paper Pieced pieces. 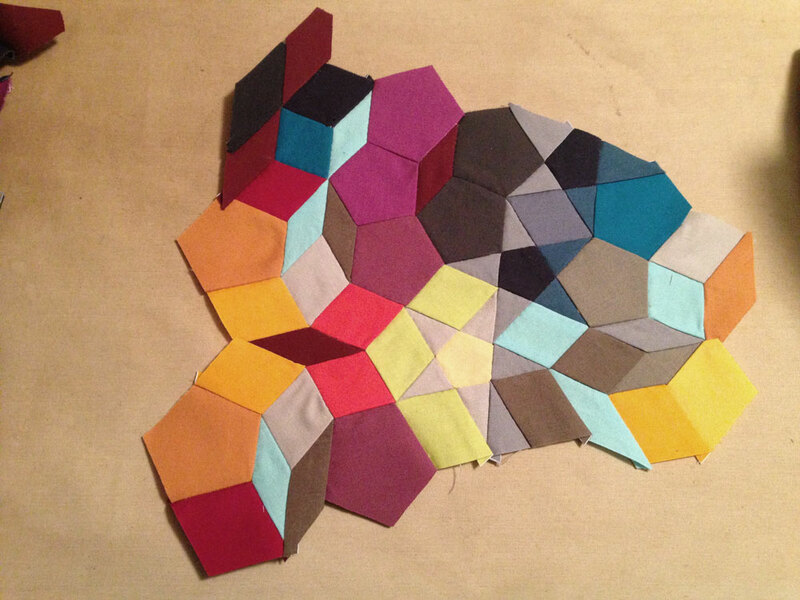 I’m already starting to plan a second quilt like this… in a totally different color story. I think the only negative compared to EPP is that when you press the fabric, the back looks messy. 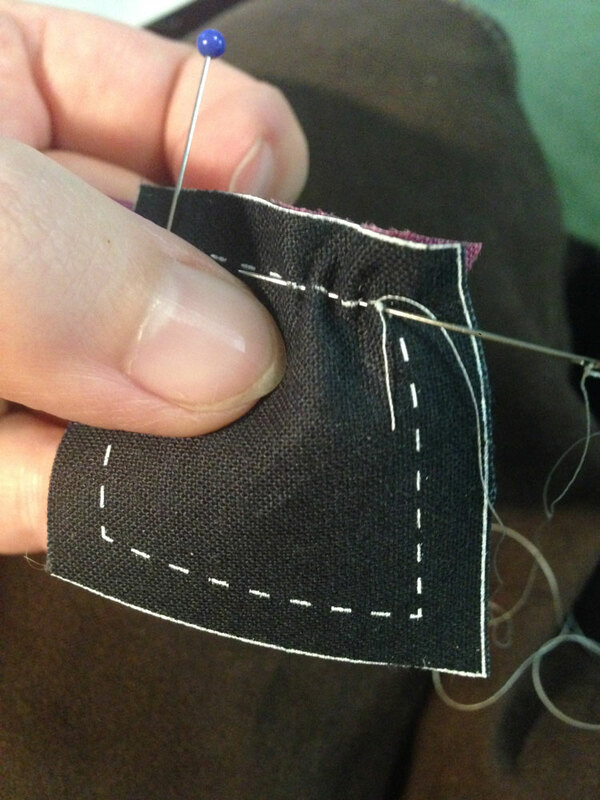 With EPP, the seam allowances are all neatly basted into place. With a good pressing… it doesn’t really matter. 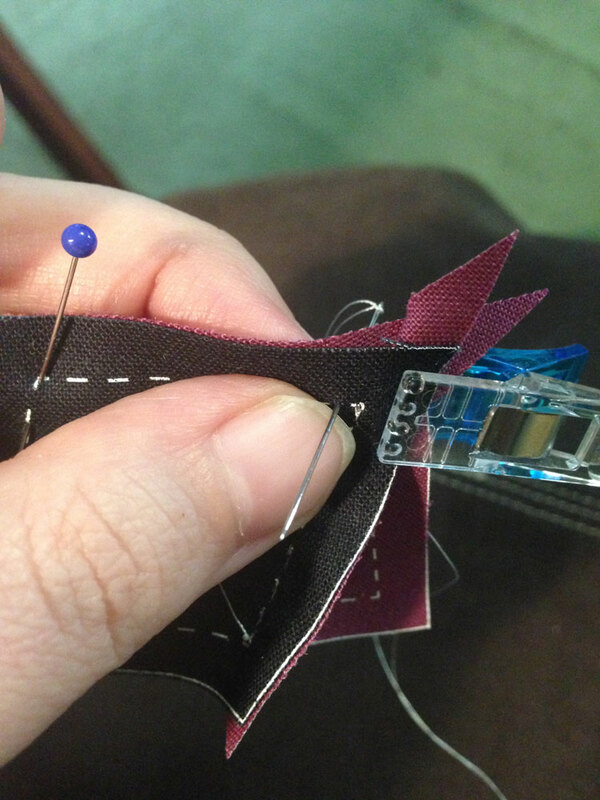 I’m really excited to finish this project… but it’s sort of like being halfway through the last book in a long series – I’m going to be a little lost until I find another hand-sewing project! Healing – A work in progress. With all that is happening in our world at this moment, I have been working hard on not letting it get to me, so I don’t become overwhelmed and depressed. It’s very difficult to live in a dichotomy where you KNOW things are wrong with our government (and globally too), yet you still need to eat and pay bills – so you continue to go to work and pay taxes and continue to do what you can. Meanwhile, more horrible things happen. I’m not sure what to do, but I do know we need solutions and not just memes. So… I’m trying to live my best life and to be positive. 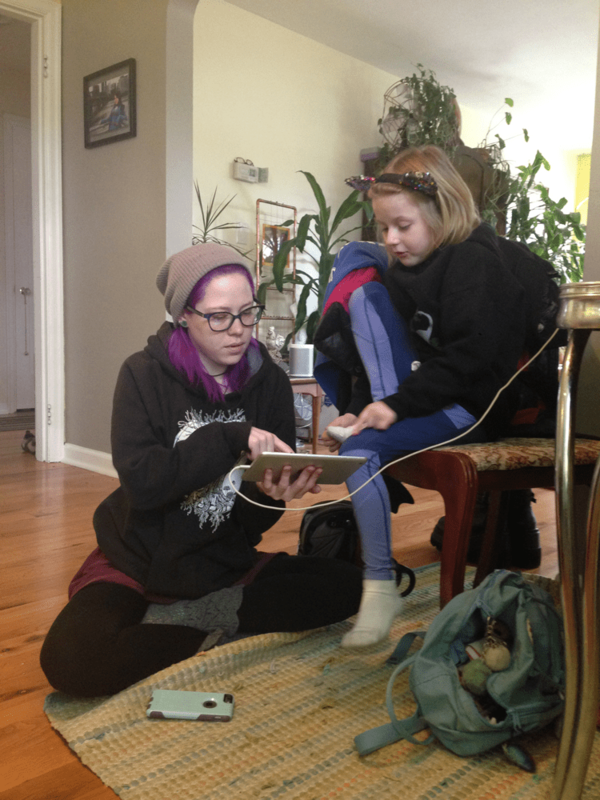 At least by adding positivity to the world, I feel like I’m helping… even if it’s miniscule. I’ve also started some emotional therapy that has been very hard and exhausting… but obviously necessary. I’m still stuck in my past and I really need to live in ‘the now’ – but it is hard to try to re-wire my thought processes. It’s just hard to unlearn certain negative ways of dealing with people… and now I’m hyper-aware of them, and realizing I come from a negative point of view almost all the time. It’s going to take a little work, but I’m doing it. 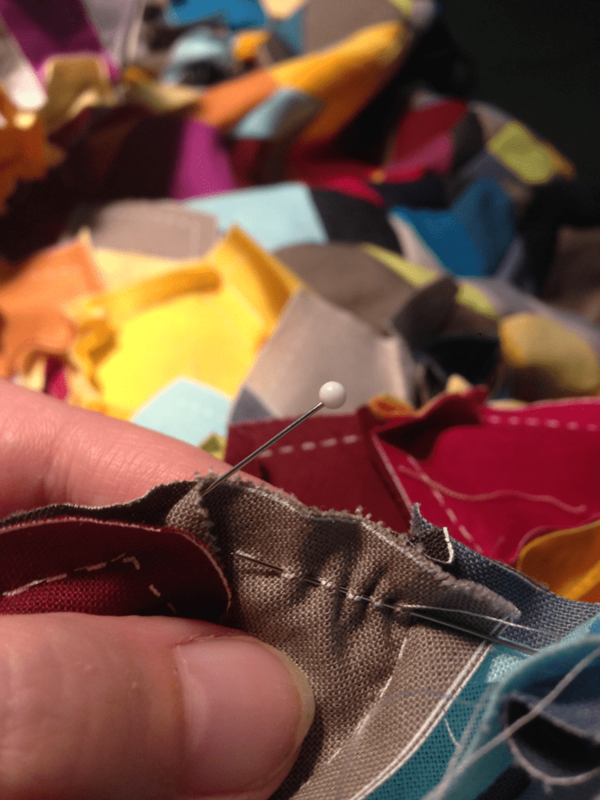 I’m so thankful to have my quilting to keep me sane… quite literally. I really process a lot while sewing. Because it can be so meditative, I can ponder things deeply. Then all this shows itself in the actual quilt work. 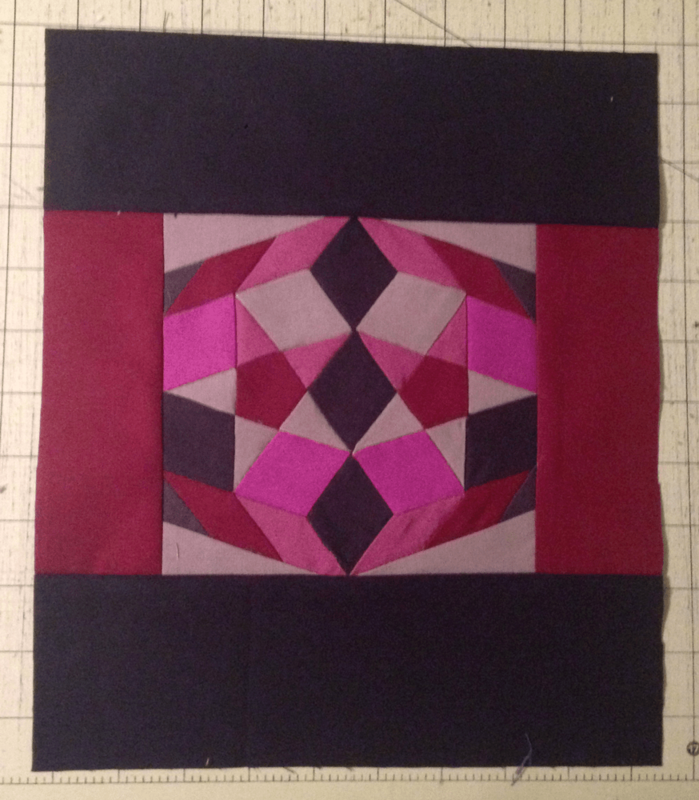 Right now I’m working on the Vishuddha Quilt and just finished the center New York Beauty block sections. It’s getting close to being done, but I can tell there is still something more I need to do with it. 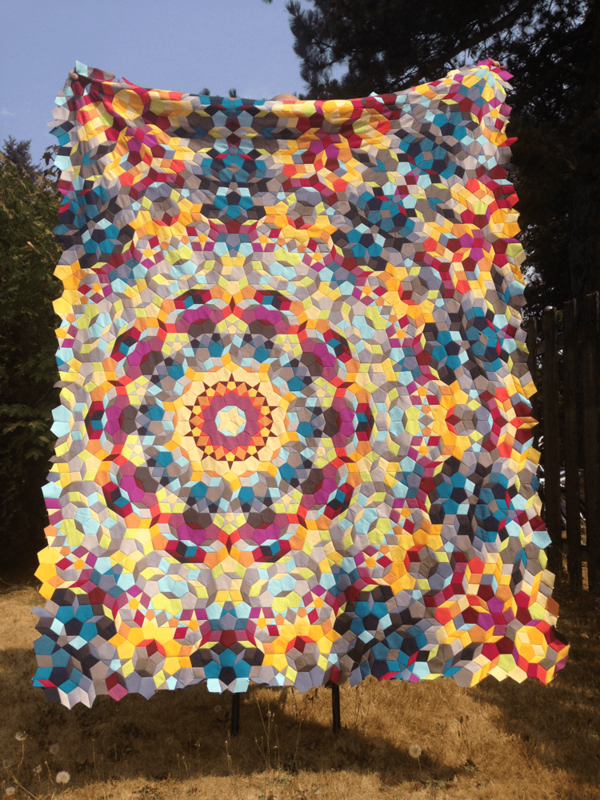 I’m also getting close to finishing the Kaleidoscope Quilt!! I’m so thrilled to have only 7 sections left! I think I might be able to finish within the next month – Squeeeee!!!! My design wall is fun to look at right now! My life has been a bit of a whirlwind recently – many things happening including work is starting to really pick up for the summer. This keeps my days full of customer service and design work. 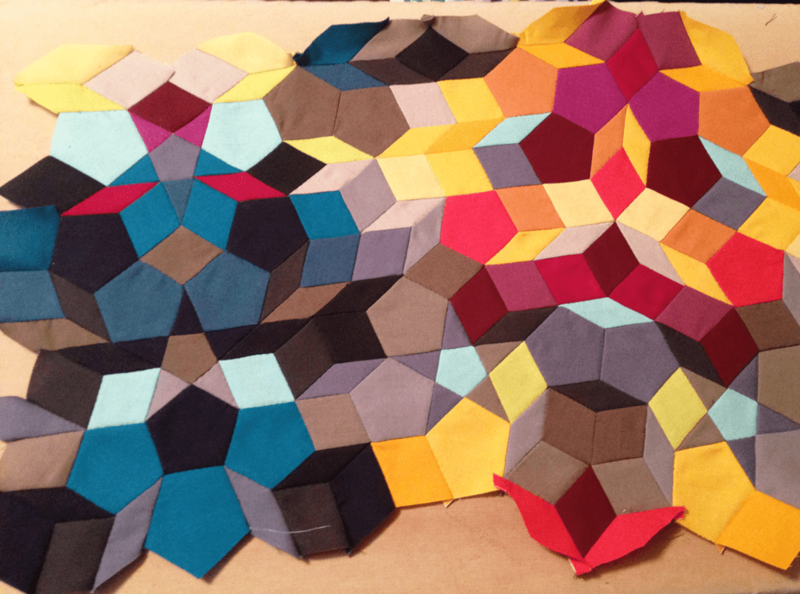 I’m also working on writing a new quilt pattern for machine piecing! 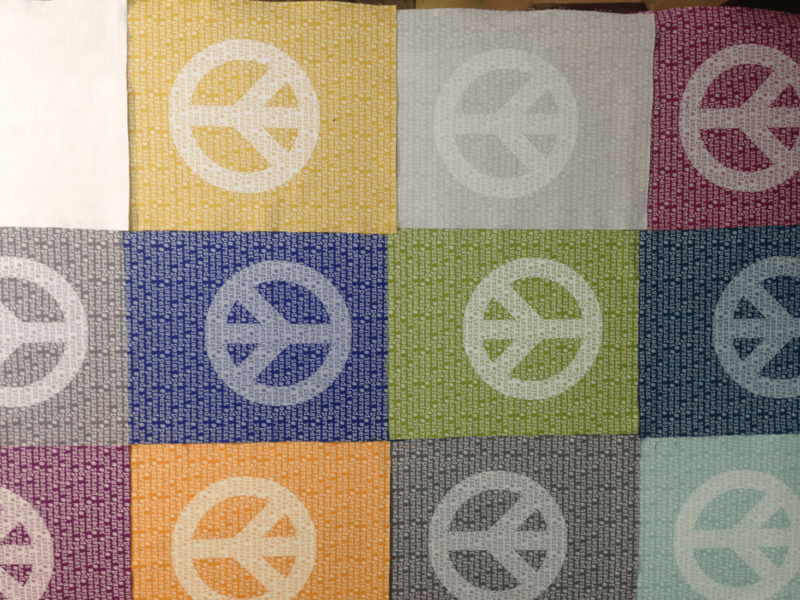 It’s going pretty well, even though I have not done a lot of writing or reading of other quilt patterns. I will definitely need to test it before releasing it. If you feel like trying out a free pattern – let me know! I should have it ready to test in about 2 weeks. 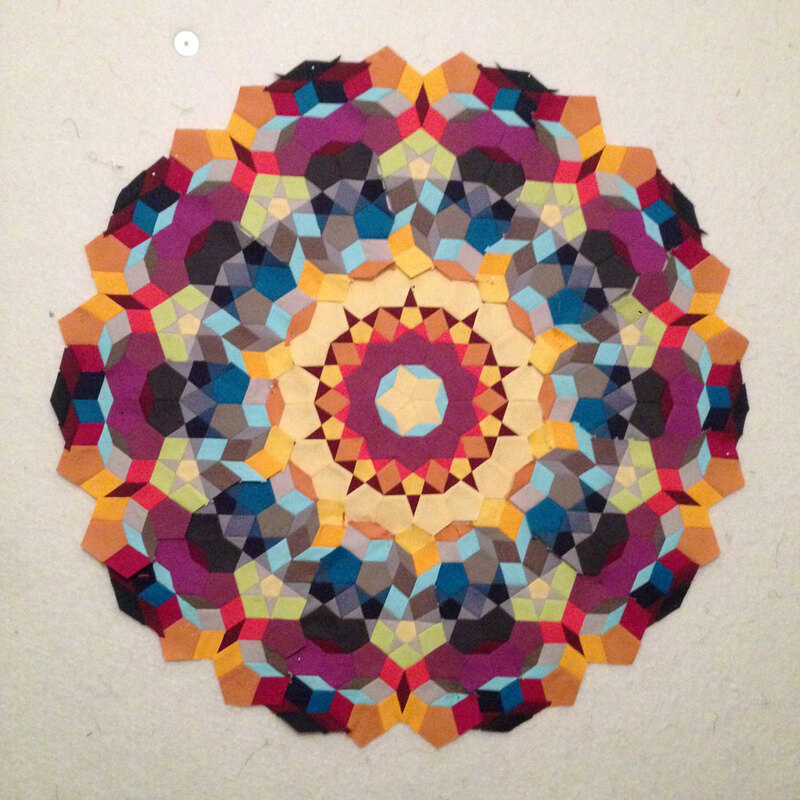 Been working on my Kaleidoscope Quilt, but not as much as I would like. I would prefer to hand sew 2 hours every night to achieve my time goals for this quilt… but it’s turning out I might sew for maybe an hour every other night or so. It’s going to take a little longer than planned. All good! I’m totally loving the process and having something to work on any time. The one question people ask all the time is: How do you iron these? I have 8 of these HUGE 4th round chunks to make! Luckily only 3 of them are complete, the other 5 are partials as they hit the sides of the quilt. I do have a pattern for this quilt. It took me about 2 months to lay it out and choose colors. Once I finish piecing this quilt top, and confirming my counts in the pattern, I’m going to set up a pattern for anyone else crazy enough to give it a try. I’v been keeping track of my time on this quilt too – right now I’m a little over 304 hours of actual stitching time in on this quilt! Right now I’m also working on the Vishuddha Quilt. 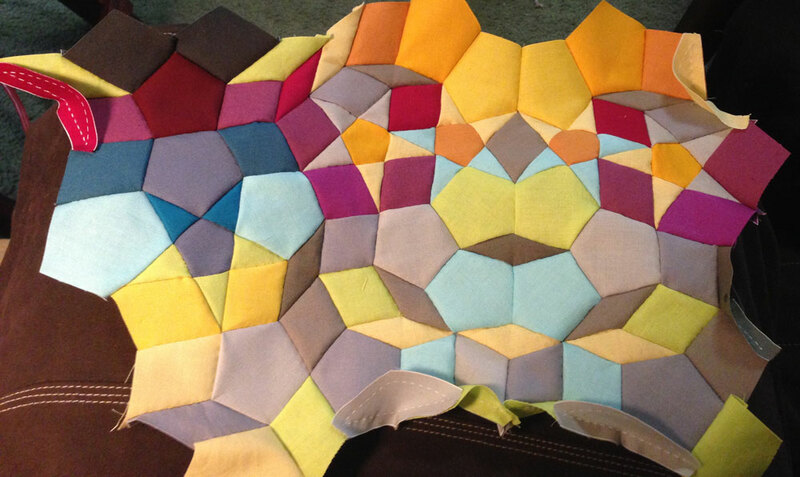 I usually only do one project at a time, but the Kaleidoscope quilt is going to take time and I need some instant gratification… at least be able to piece a little faster than when I hand stitch. Another part of my whirlwind this month was being able to see my little neice Lily! She came with her mom, who is my amazing SIL from NYC. We all had a great time visiting and checking out Portland, but the best was when these cousins got to spend time together – so sweet. I’m off to enjoy some sunshine – it’s gorgeous out today! I find I become a little manic when I’m anxious. I tend to do a lot of cleaning and organizing – and I’ve had a lot to do recently in that regard, so it’s been a good year so far. We put some new shelving in the closets of my sewing room/office and I got a new desk, so I emptied my whole room, cleaned and rearranged a bit, now it feels much better. I still need to go through my fabric stash and organize it, but once that is done, I’ll be ready to start working on some new quilt ideas that have been rumbling around my head. Another thing keeping me busy is the launch of our new online store. This entails so many things! Photography, marketing, designing, data entry, shipping, etc. – but I’m getting a little better at it all, and found some really great apps that help a lot. I’m so thankful for all the fantastic and supportive feedback we’ve received – I know this was a good thing to do. 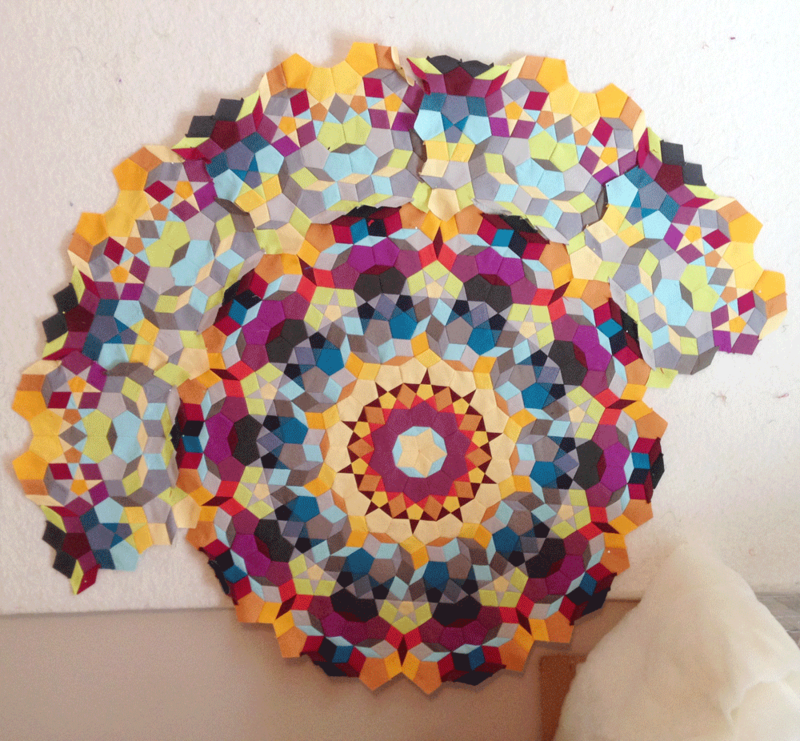 I’m still working on my Kaleidoscope Quilt. I’m currently on the 7th chunk of the third round. Not sure if that makes sense… but I’m definitely making progress! I’m keeping track of my time and I’m currently over 210 hours of actual stitching time! 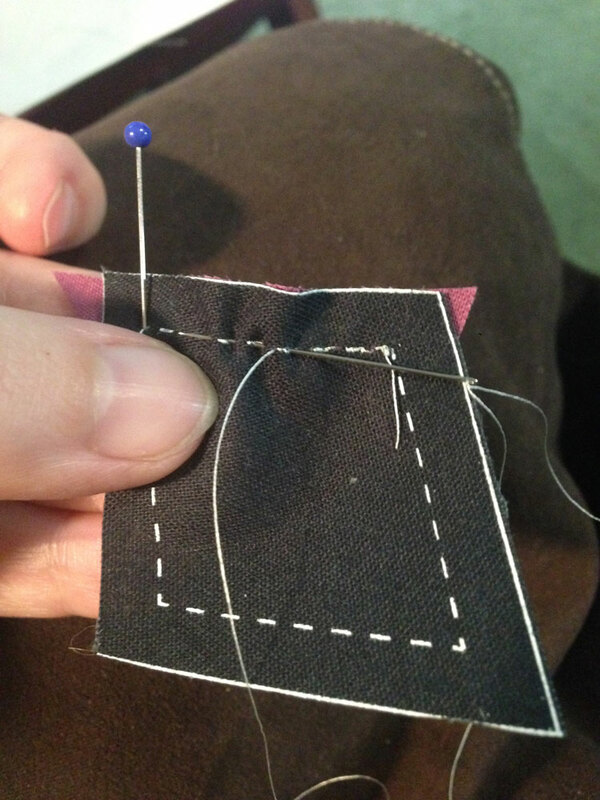 It seems like a lot, but I try to dedicate at least 2 hours a day to sew, so I can see progress. 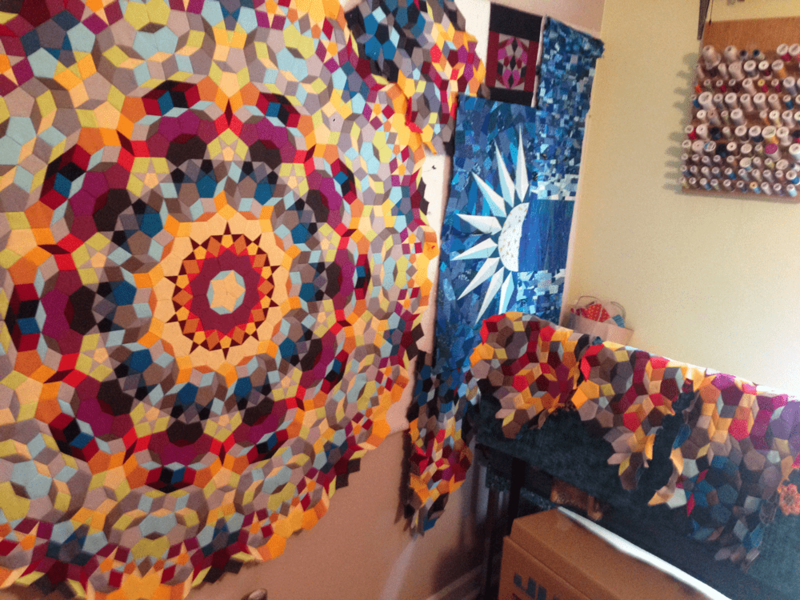 Since I’m going through my fabric stash, I’ve also been contemplating the Chakra quilts I’d like to do to go with the other two Chakra Quilts I’ve made. I think the first I will tackle will be the Throat Chakra. If you don’t speak your truth, this chakra can become blocked and causes all sorts of issues. A good description of the Throat Chakra here. 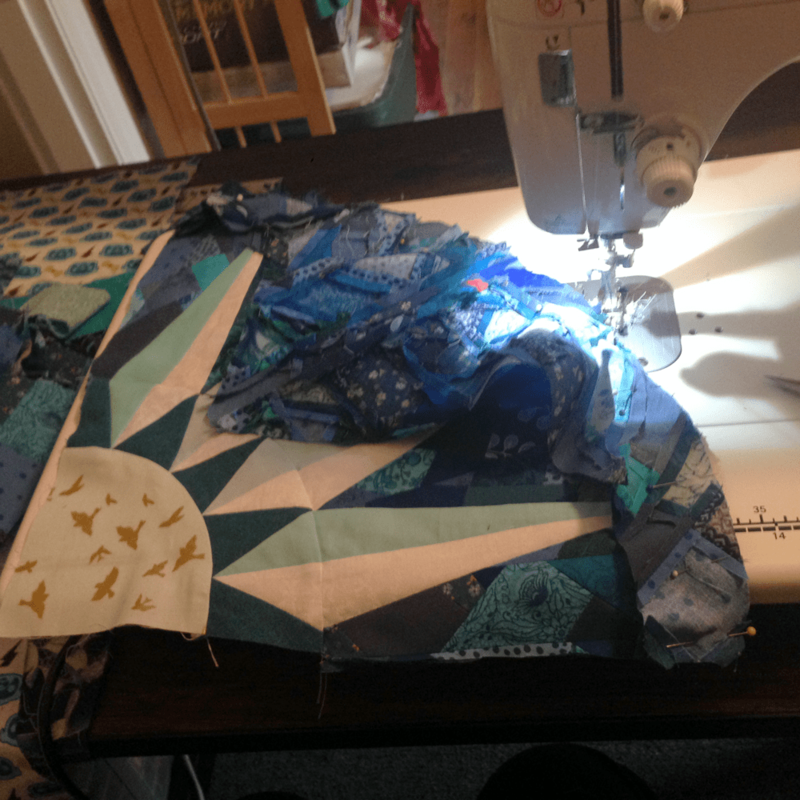 I don’t have many blues left in the fabrics I have… I will really need to think about how I want to go about this. 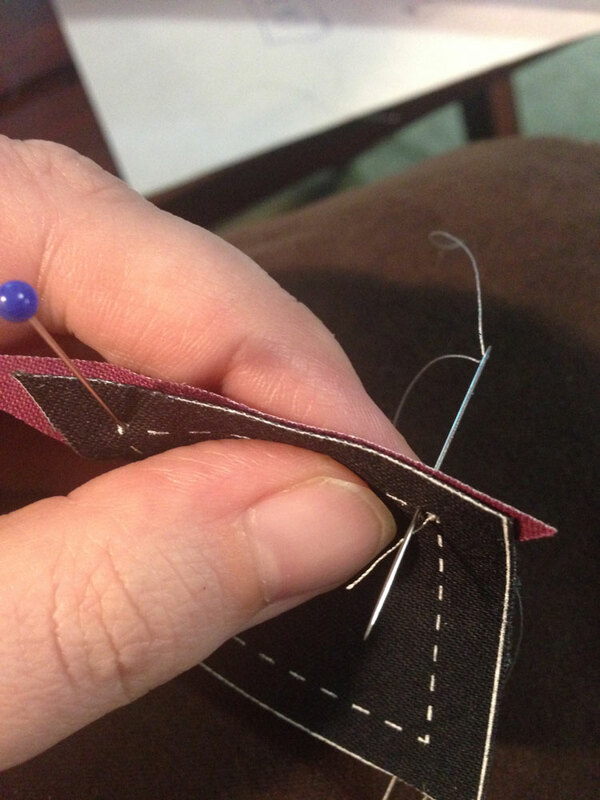 I think to start, I’ll just start sewing little bits of scraps together to make larger pieces to work with. 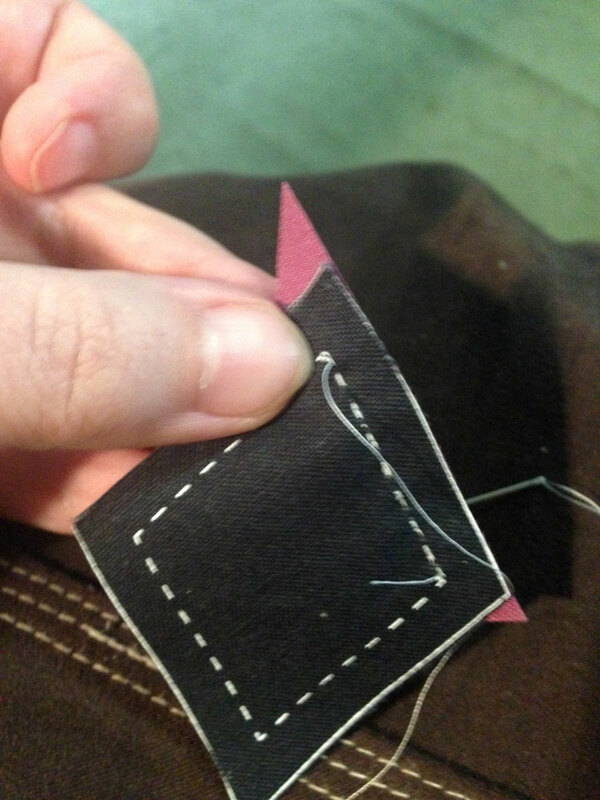 I really just want to work on my machine – hand work is great, but machine sewing is so fast and satisfying! It’s up… our online store is up!! It’s a store that combines my love of fabric and quilting with Gregg’s (my husband/partner) screen printing ability. It’s what I’ve been working on this winter to keep me busy. Pretty exiting! Our approach to business is a low-tech, slow-grow, and hands-on. We don’t plan on automating or investing in a digital printer. We want to keep the craft of hand-pulled screen printing alive and well . This is what makes us very different from most ‘printers’ you find online who either use their own digital printer or they use a third-party printing platform like Society6, Printful, Cafepress, or Spoonflower. Digital printing technologies have made big advancements over the last few years. It is this technology that makes it difficult to compete as a manual printer, and is part of the reason why we are trying this retail adventure! This is the most exciting thing for us to try! 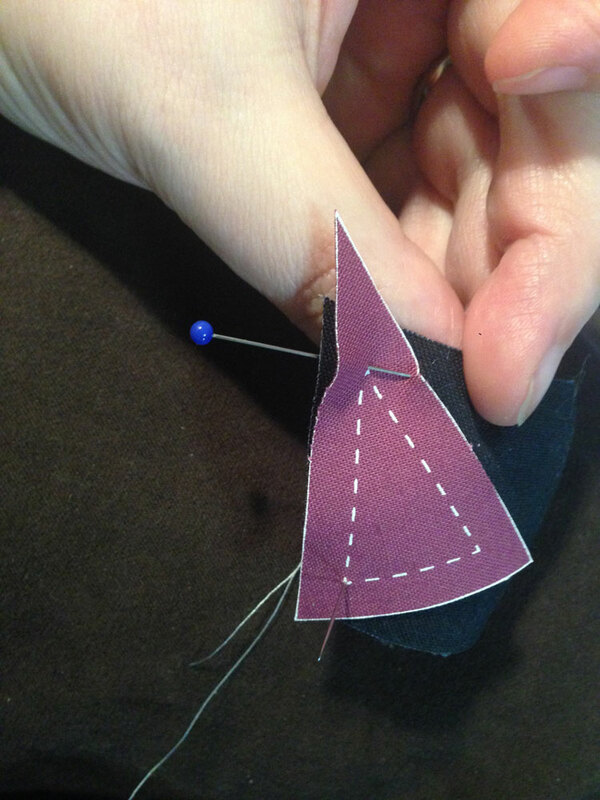 Being a hand stitcher myself, I have often used the EPP method (English Paper Piecing) for sewing shapes together. This is where you use die-cut paper templates to baste fabric around to make your ‘pieces’, then you stitch all the pieces together. This takes a bit of time, so I tried tracing my sew lines on the back of the fabric and using a running stitch with y-seams, and that was much quicker, but less accurate. Then I thought that we could screen print the cut and sew lines on the back of fabric very accurately… and I had to try it! 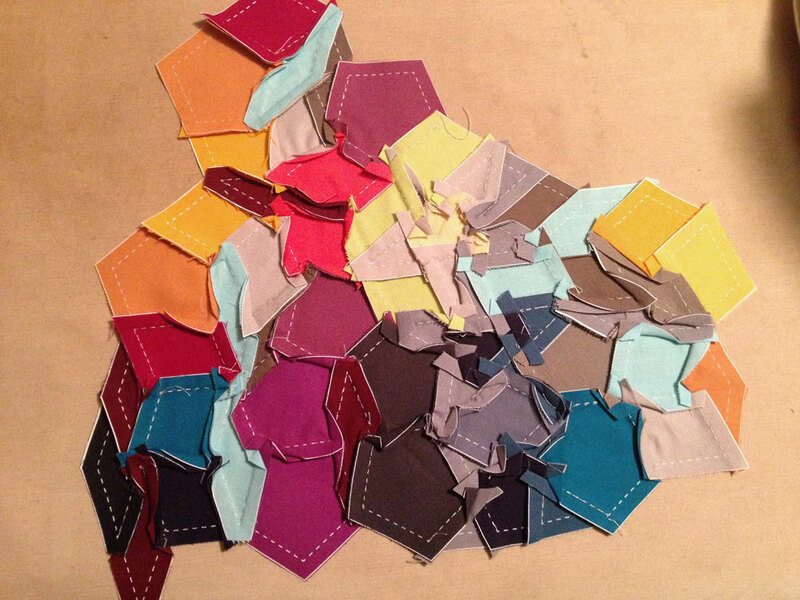 Now that I’ve been using my NEPP (Not English Paper Pieced) pieces, I’m flying through my current hand sewing project! 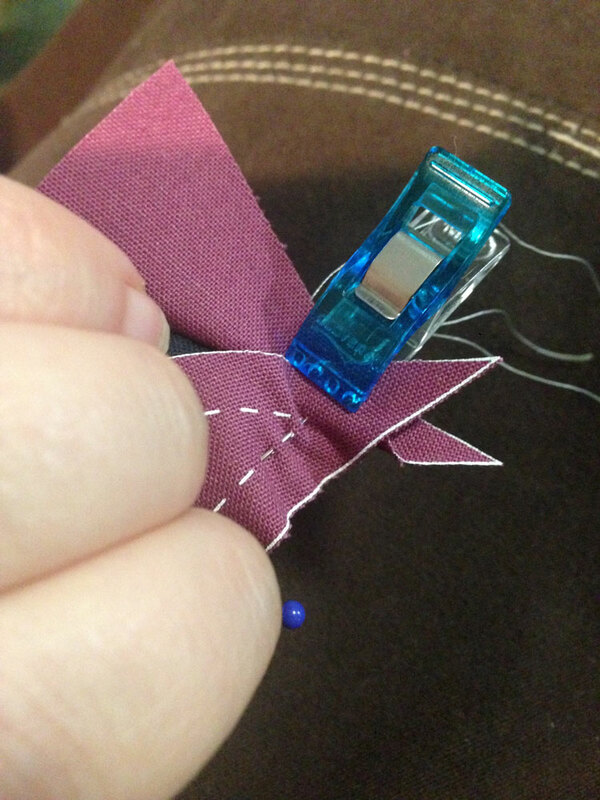 we are creating NEPP Hand Sewing Kits! 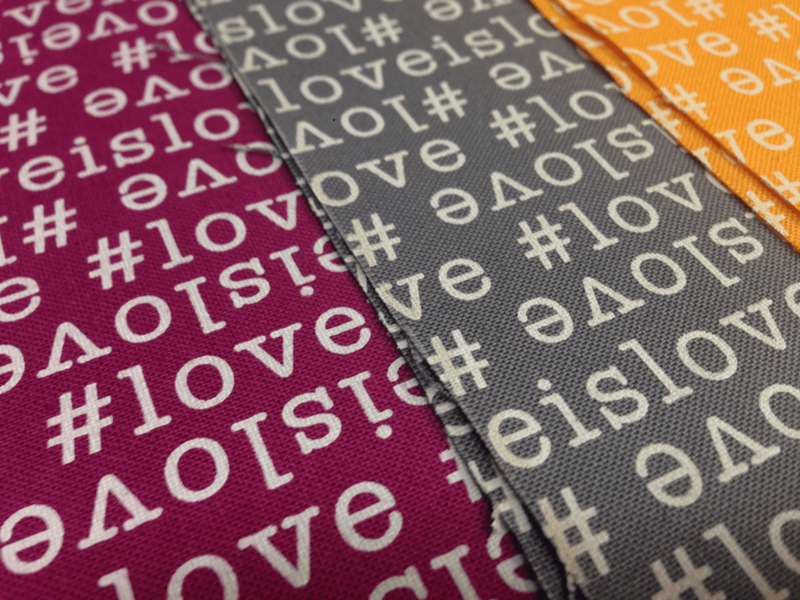 I’m designing the color layouts and we are currently using Kona Solids for fabric. 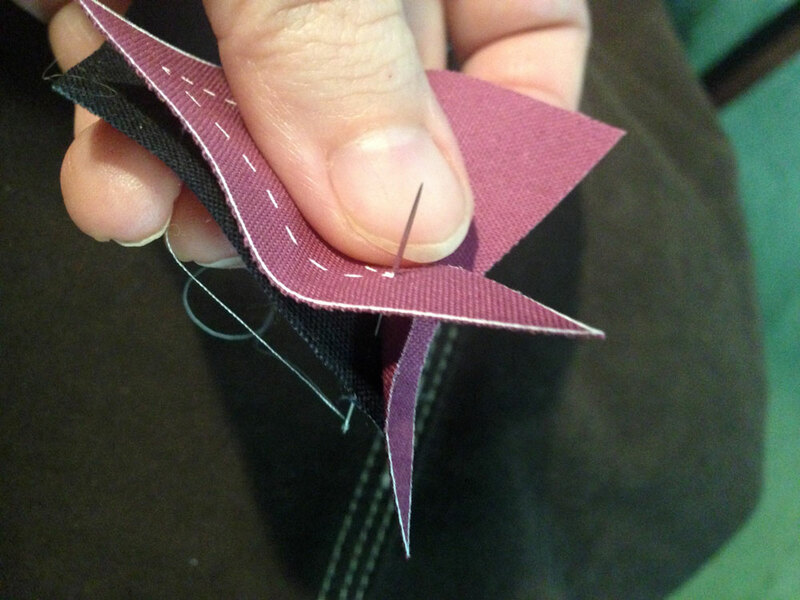 The kits will have all the pre-cut fabric pieces with accurate stitch lines and Y-seam start/stop points for smaller, less daunting projects. Each kit will have tracing templates to give the project right angles so you can easily add it into any other patchwork. Kona colors are listed for matching purposes. 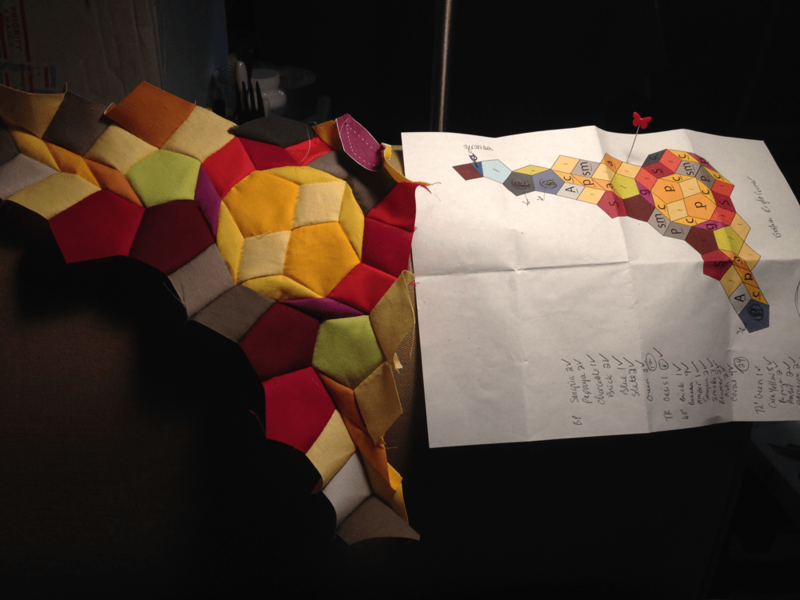 I put my Hexie patterns up and plan to try to write at least two other patterns for machine-stitched quilts by the end of the year… it’s good to set goals, right…? We made a category called Handmade for things that don’t fit anywhere else. I have a few quilts and other quilted things, and we have old printers-proof posters, and cards we hand-printed years ago and when we did hand printed flat stock. It’s time to let go. We’ve done a few of these over the years… it’s a great way to offer a featured design on many different apparel items without having to keep inventory! These are limited edition prints in every way. There is a set ORDER BY date – usually allowing for 2-3 weeks time for people to place their orders, and there is a SHIP BY date stating when we will have the shirts printed and shipped by. We plan to do one Pre-Order a month. This month for our opening Pre-Order Sale, we are working with Sam Hunter of Hunter’s Design Studio as our Featured Designer! 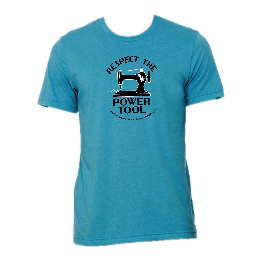 The design is: Respect The Power Tool. We are so excited to be able to work with other creative types in this way. It helps our sales and the designers get a percentage of every purchase using their design. I have a birthday coming up and so age has been on my mind a lot lately. I think the only way I got to this point in life is through active positivity. If I did not constantly work on positivity, I would be the most negative person. I know this because I was nihilistic as a young person, and that is what drove me to drink and use any and every intoxicant that came my way. Because of my lifestyle, I was sure I would die by the age of 25. In a way… I was extremely fortunate to become pregnant when I did. Even though I was young, homeless, and depressed. I didn’t even want to be a parent – but I bonded to my belly bump early on, and that is what gave me the reason to take on the major struggle to make things better in my life. To do that, I needed to make drastic changes, and I did. The biggest change was to be positive. Not just about my future – but in the way I look at *judge* others and myself… how I internalize politics and religion… how I internalize everything – all of it needs to have a positive tone or I start to swirl down the depression spiral. This is part of why I quilt. Fabric and color make me happy! Working with my hands keeps me super busy, and the elation I feel when I complete a project is better than any high I’ve ever had. If you’ve ever had issues with addiction, you may also understand how things usually never get finished – how the house becomes full of half-finished projects… so to finish anything is exciting, and makes me feel good. Celebrations and gifts are not my type of birthday thing. I like to take a little time to meditate on the upcoming new year and send a little positivity ahead of myself. Just getting here is the best gift. 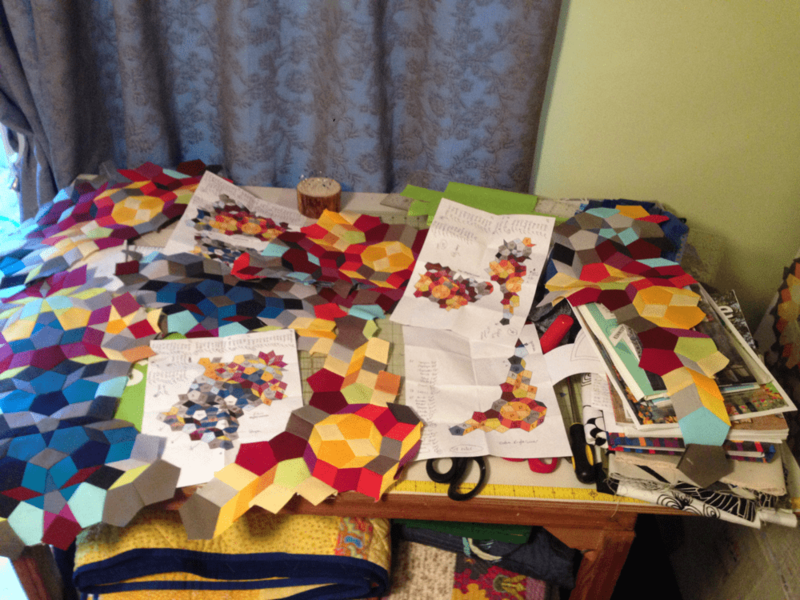 I’m still working on my NEPP Kaleidoscope quilt (Not English Paper Pieced) – the chunks I’m currently working on are taking about 16 hours each to complete… and there are 10 of them! At this point, I have 143 hours logged in hand stitching time. Which leads me to the most exciting thing I’m trying this year: retail sales. 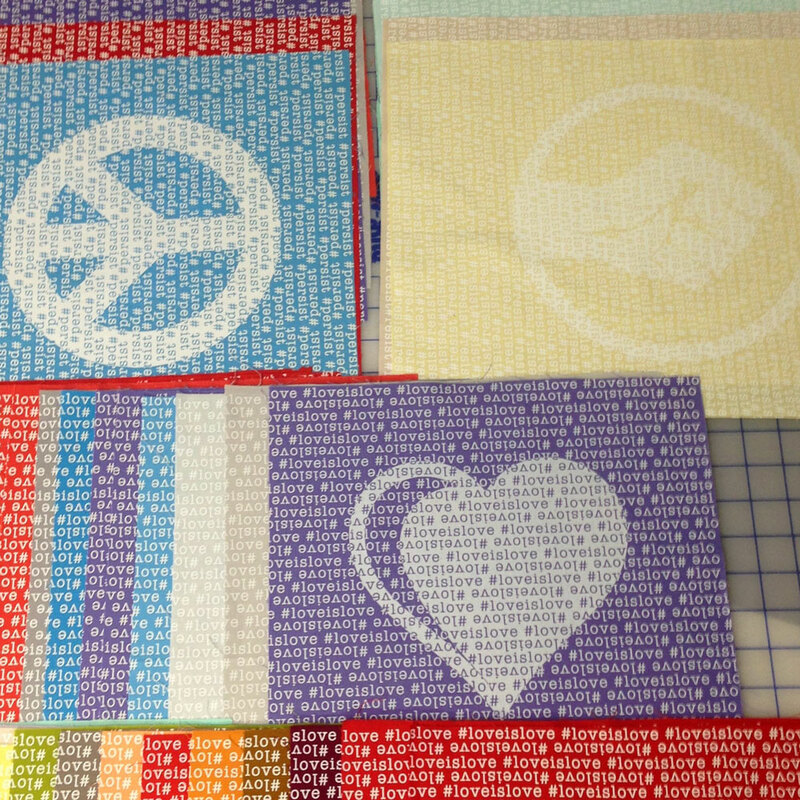 My husband and I are working on NEPP kits and pieces as well as hand printed fabric panels and T-shirts of course! The plan is for the ChickenScratch Store to open 2.12.18 and we’ve been working hard over the last few months to print product and prepare the online store. Now it’s time for some photography! Another thing to keep me positively busy. 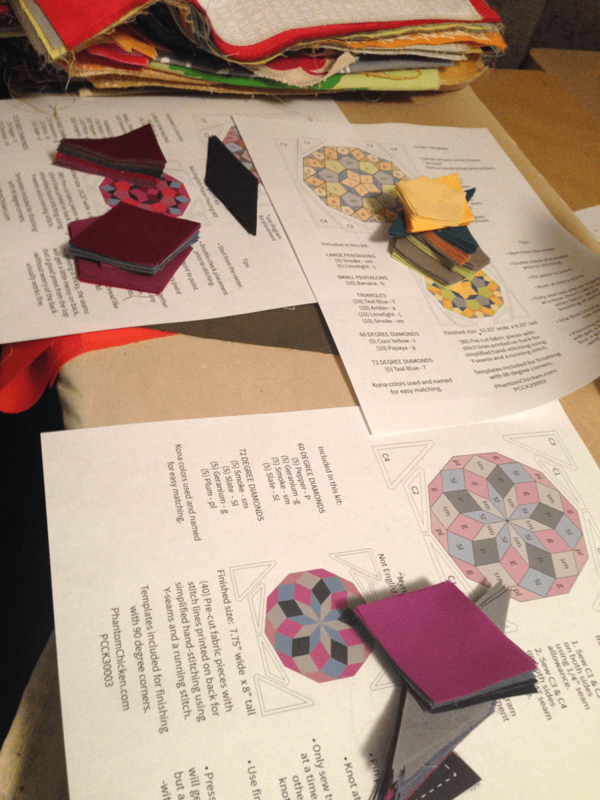 NEPP Kits – full sheets ready to cut! 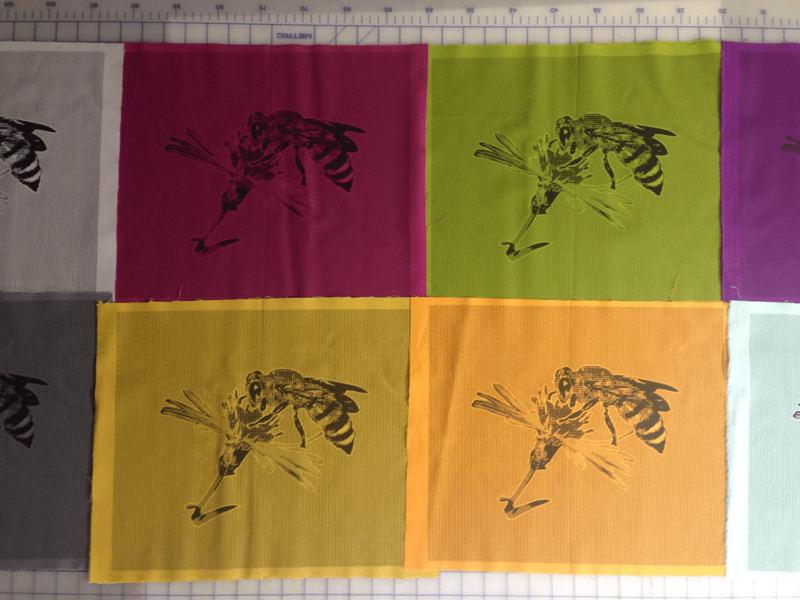 Hand printed fabric panels – ready to be serged, washed and pressed. This time of year is difficult for me, but it’s almost over! I can still find enjoyment during this time because our clients take time off work so we get a little time off too – it’s good for mental stability, and I love the down time with my family! The 4 on the left are smaller and much less difficult and will finish at about 8″ around. The kits will come with tracing templates to finish all edges to be at 90 degree angles so they will be easy to work into other projects. 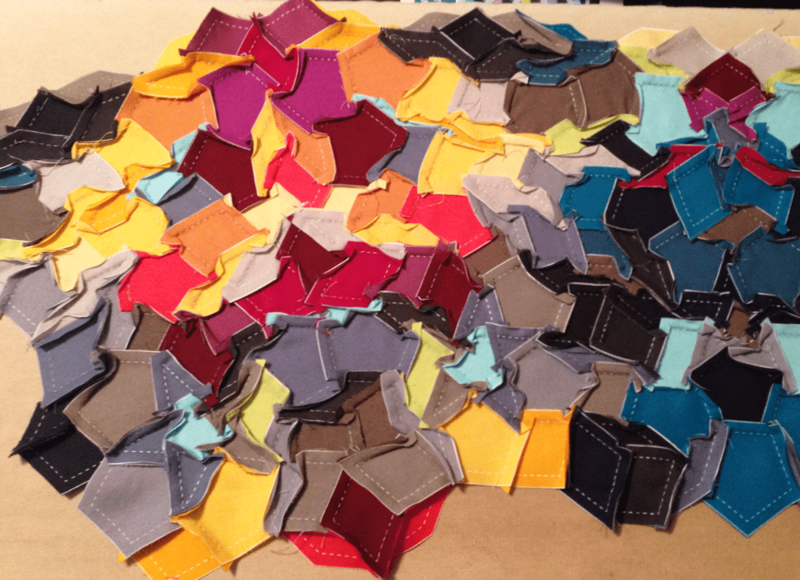 The larger ones on the right are made of 275 pieces each and will be approx. 22″ around. 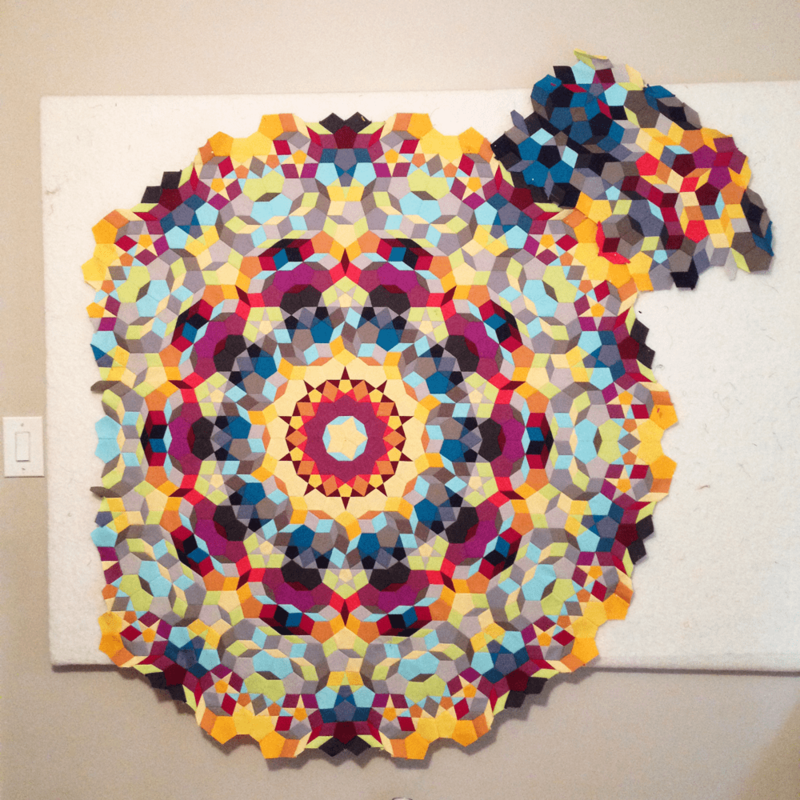 Such a fun project – so pretty! 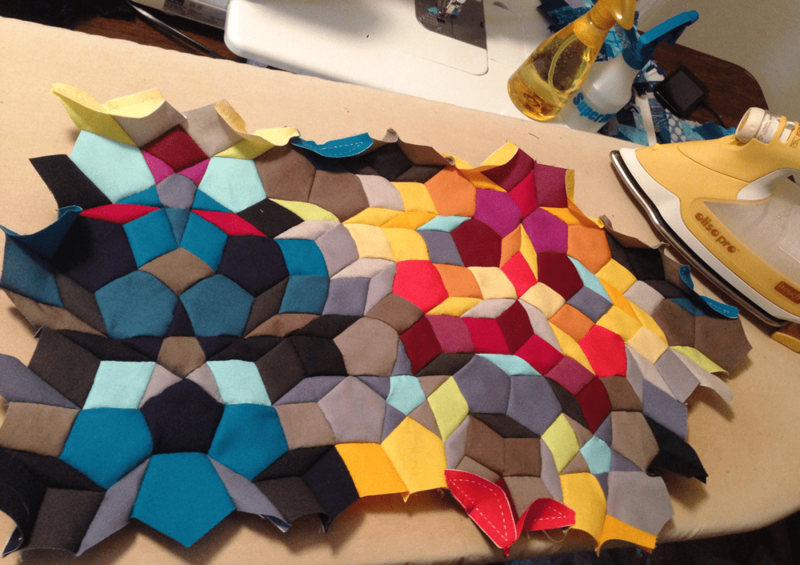 This piece is almost double the size of the secondary chunks – this one piece took me 16 hours and 10 minutes to sew together. 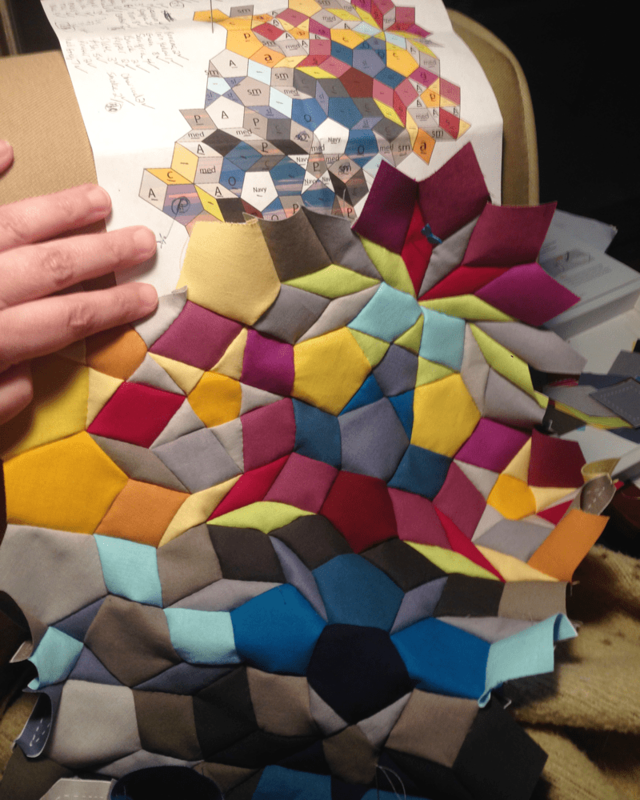 Currently at 118 hours in sewing time on this quilt – yes, I’m timing myself. The stopwatch app works great for keeping track, and I haven’t forgotten to keep track yet either, so this is a very accurate number. I would guess I’m about 1/4 of the way finished. 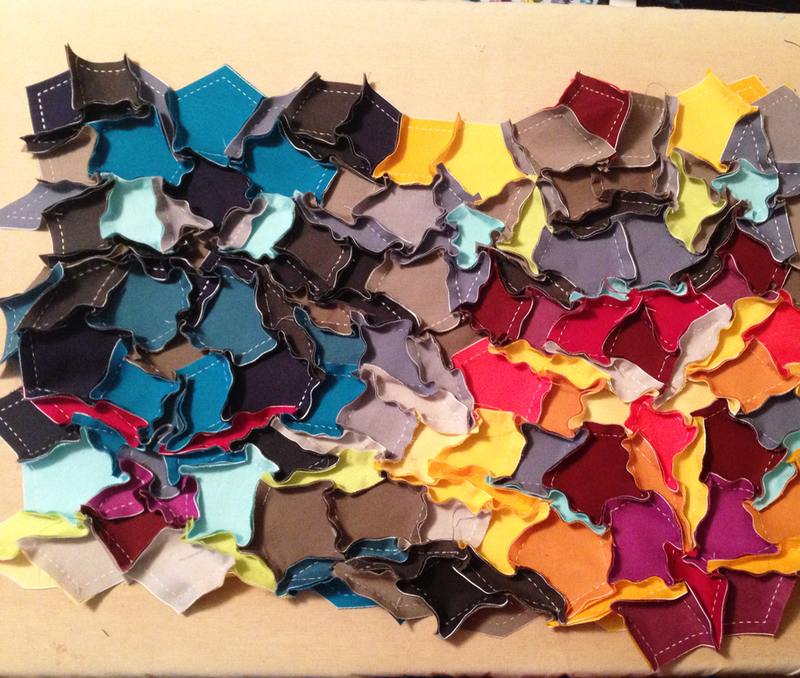 I can only wonder how much longer it would take if I was paper piecing the whole thing?! BTW.. Thanks for following my blog, I really appreciate all the support and feedback you all have given me this year. Happy Holidays! I’ve been stitching away this weekend! 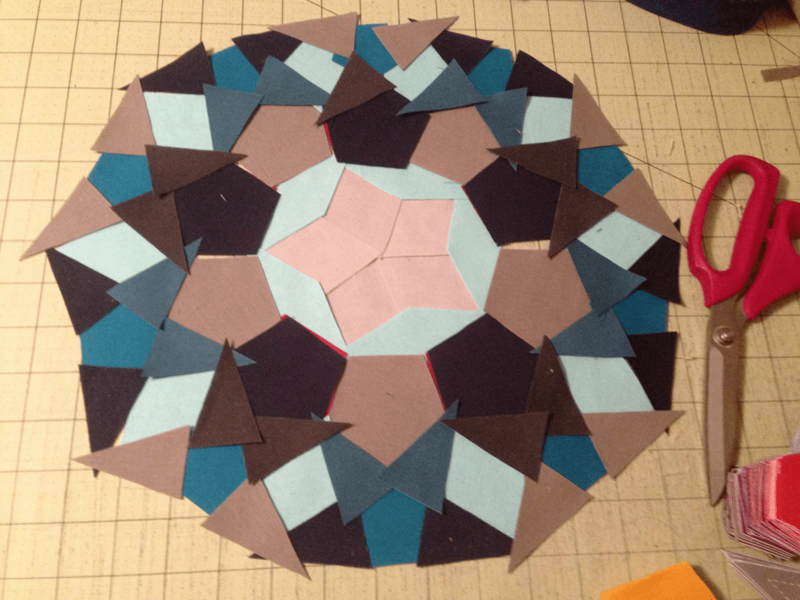 Thought I’d do a quick post to show where I’m at on my Kaleidoscope Quilt project! I recently finished the last two “secondary” chunks and got them up on the design wall. I found pressing was the easiest when just pressing from the top down, and not caring what the back will end up looking like. I’m so excited by this… everything is matching up perfectly and giving me really crisp points! I’m also quite thrilled to start on a different looking section, I’m done with this secondary ring! 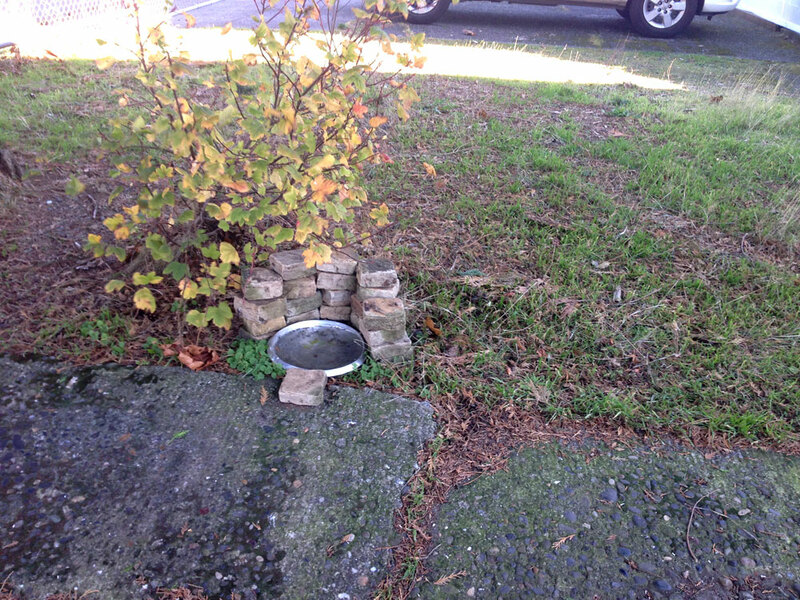 On a more home-based note: It’s been very windy here in Portland, so my husband built a little squirrel wall to protect their water dish. He now has crows, songbirds, and squirrels that come running when they hear the door open in the morning. 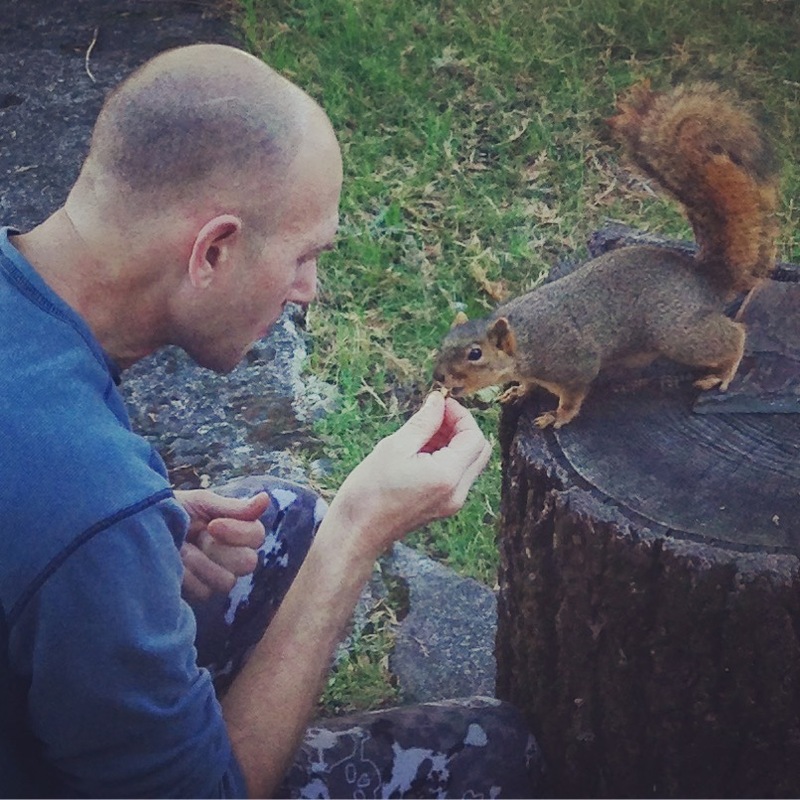 Yep… he’s definitely a squirrel whisperer! 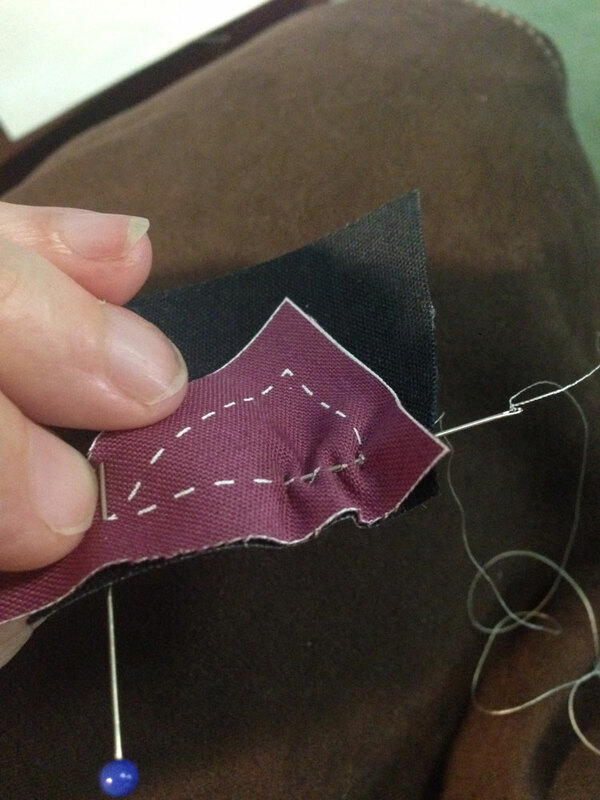 This tutorial for our NEPP Hand Sewing Kits, but can work for any running stitch application. *Note: I am self taught. I tend to over-do things with hand sewing because I want it to last. I am always learning – if I learn something new to make this process better, I will update as necessary! Thimble – Dritz Soft Comfort Thimble size M – it’s inexpensive and works pretty well. For our kits, I would recommend laying out all the pieces before sewing – it’s easier to check placement that way, but it’s not necessary. 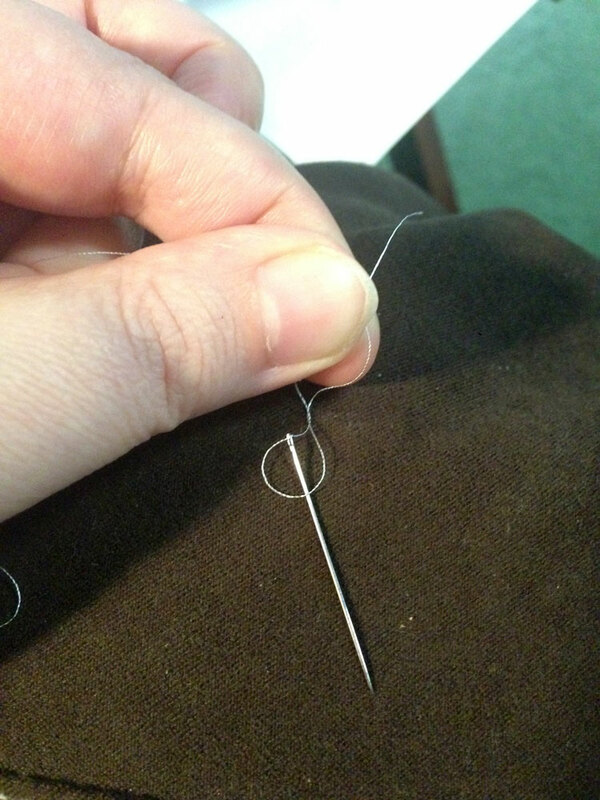 Now, pull about 12-18″ of thread from the needle to the spool and cut. 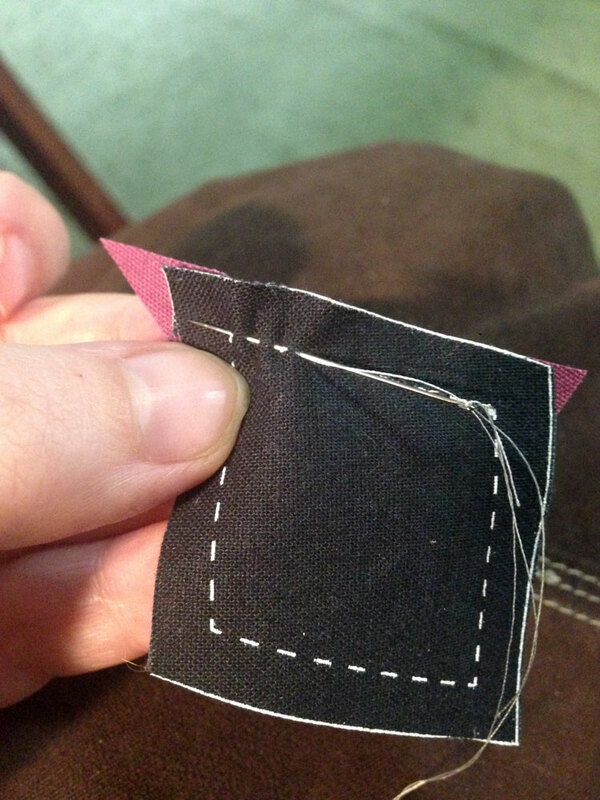 You don’t want it too long, just enough to go from your hand to your elbow – to make a nice one-pull stitch. 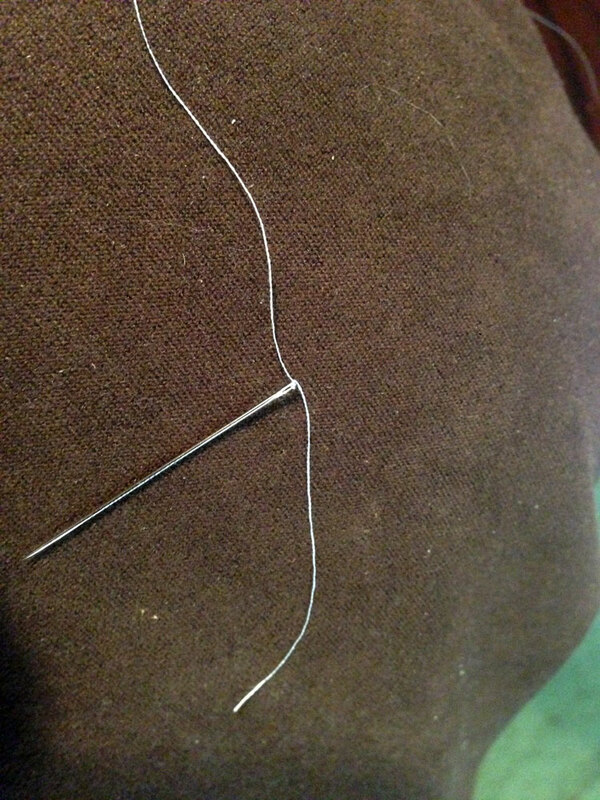 Make a quilters knot at the other end. There is a tutorial here by Amanda Lipscomb on how to do that. 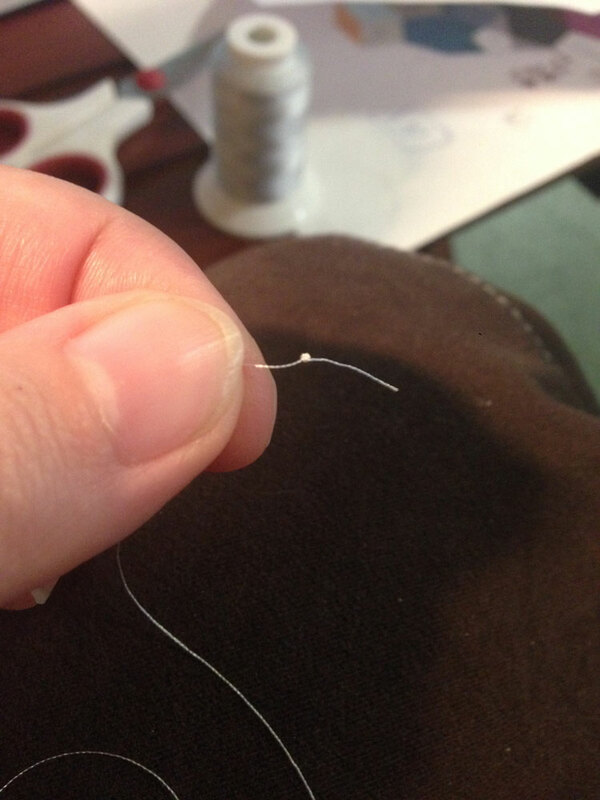 Again, since I’m using fine thread, I “wrap” the thread about 6 times instead of 2. YAY!! 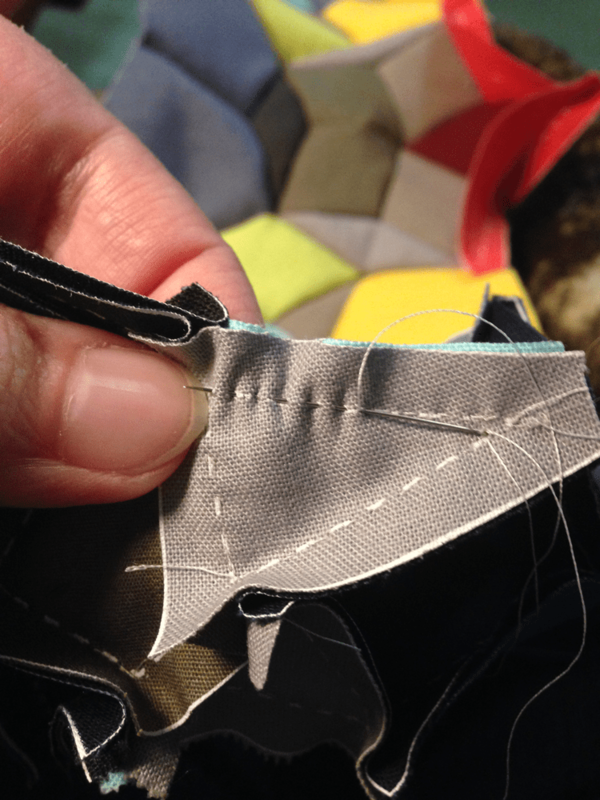 You made your first Y-seam! Keep going until you get close to the end of your thread. 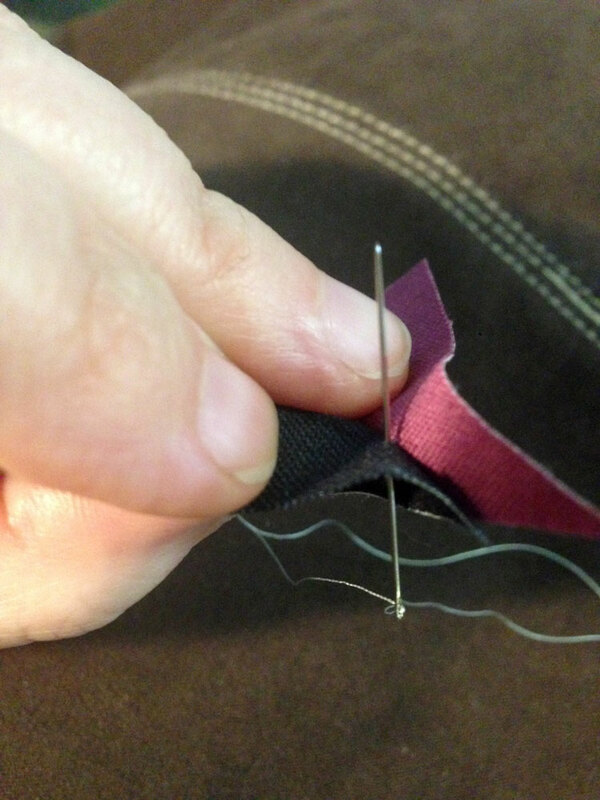 Get to the end of a seam and tie a knot as usual, then tie another knot into the seam allowance of the top fabric (only one piece of fabric) – do not tie the ending knot into both fabrics in the seam allowance. 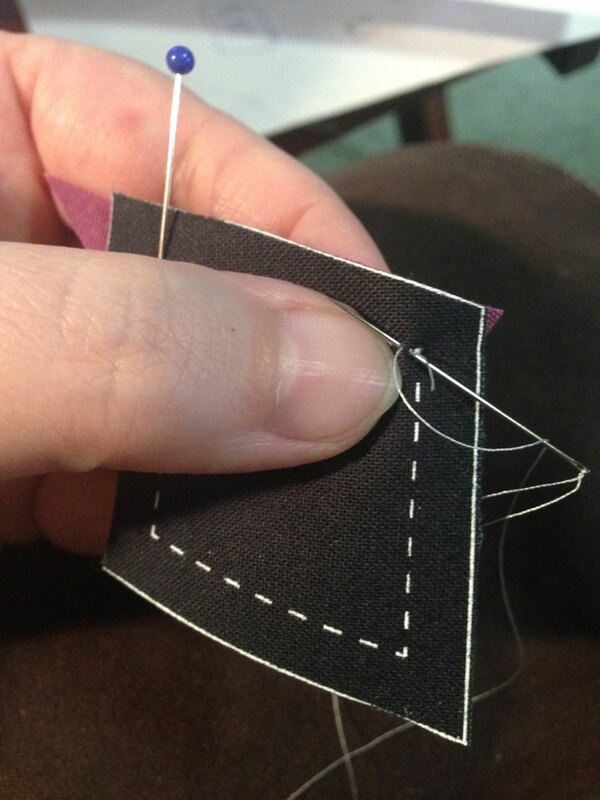 I really hope this is helpful in getting someone new to feel comfortable in starting a hand sewing project like this. Happy Sewing! I just looked at my drafts for this blog and I have 6 unpublished posts from last month that I will not be posting. Each one of them is about dental pain, and anxiety, and the frustration of not having decent healthcare… and we each have our own version of that stress – so no need to hear it from me! This is the reason for my lack of presence lately. Luckily, I did have an infected tooth extracted last week and I’m feeling like a different person altogether. Now I can focus on some really exciting new things in my world! What am I talking about…? Well, as you may, or may not know… my husband and I have a screen printing business and we’ve been printing t-shirts locally over 20 years here in Portland. T-shirts are great, but I’ve been wanting to get into fabric printing for a while! 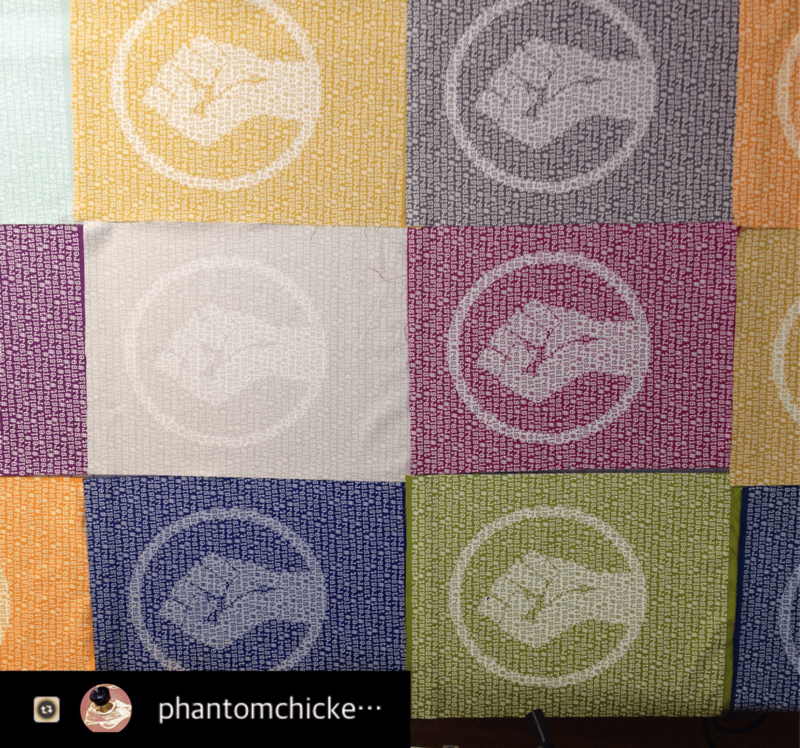 Since our studio is set up for T-shirt printing, we are not capable of printing full yardage sizes of fabric, so we’ve been trying what we are calling “fabric panels” using our largest possible print size of 12″ x 13″. 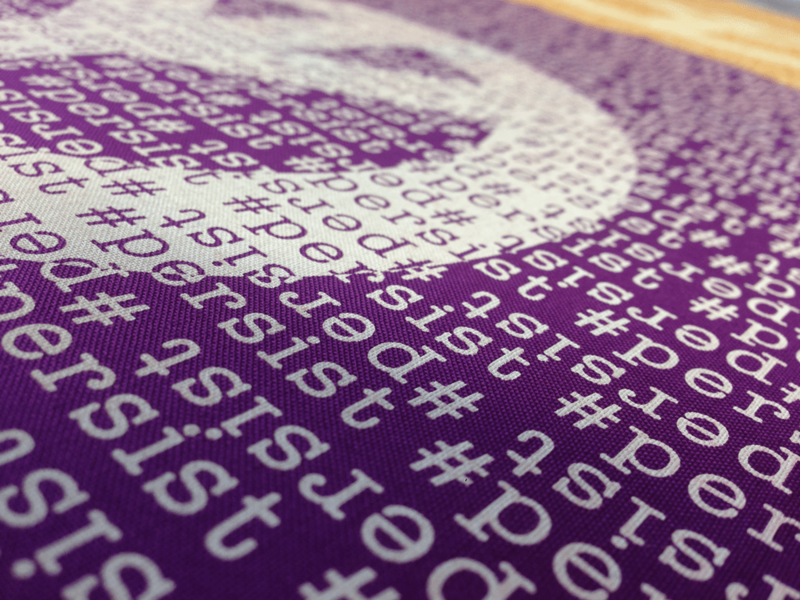 We are also using discharge and waterbased inks so that the fabric can be ironed directly and after washing. 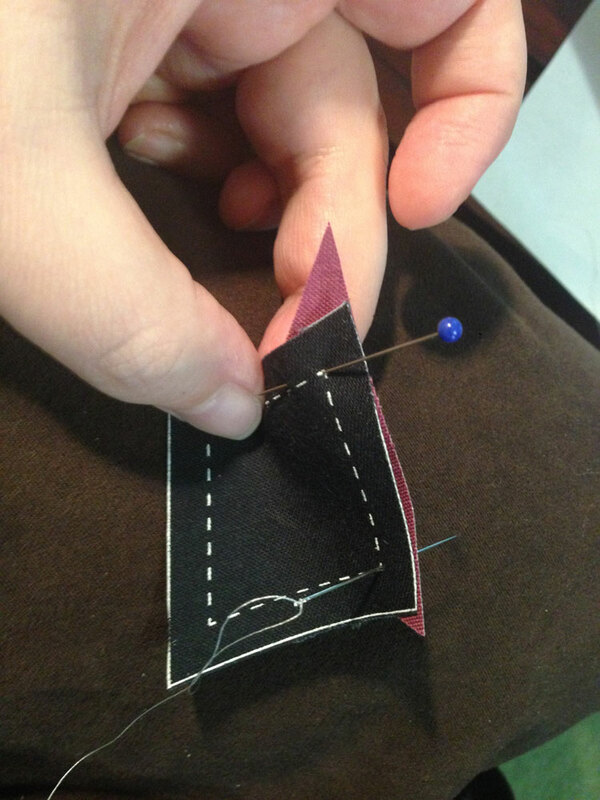 The ink is set into the fabric, rather than ON the fabric. These inks leave a residue on the fabric that should be washed prior to use. We’ve decided to serge the edges so we can wash and press each piece before selling. That way, they will be ready to use. I think they would be great as a quilt center or sewn into a tote bag… but since the edges are serged, they can be hung on the wall or sewn to a jacket back, or used as a pillow front. 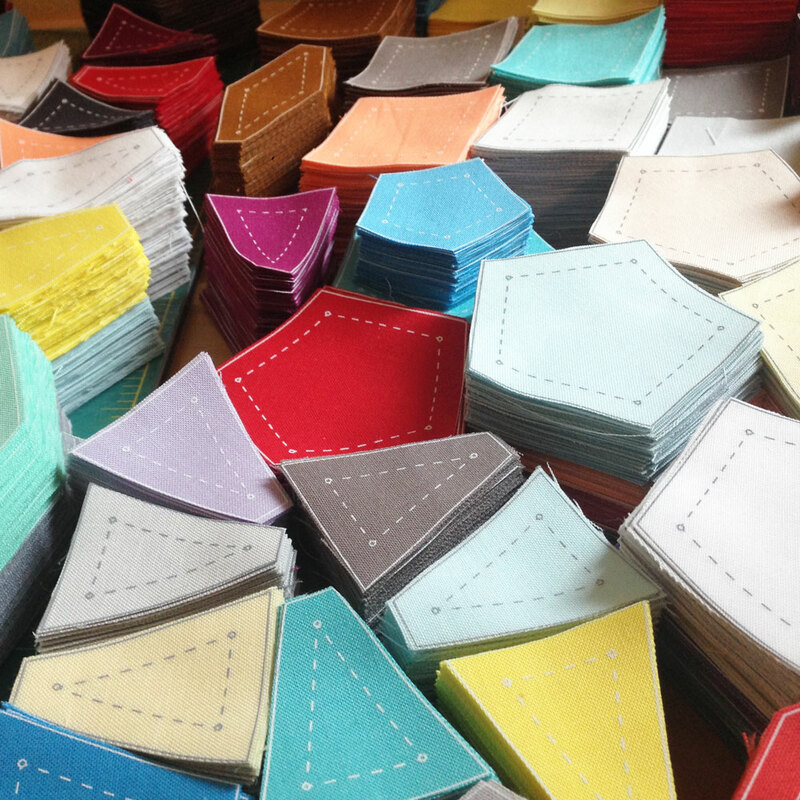 Of course they can also be cut up and used as quilting pieces too. 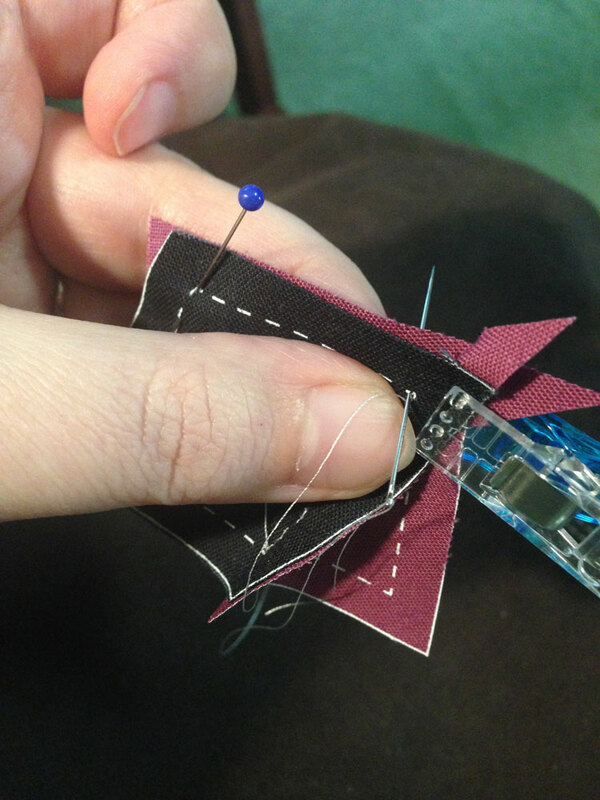 Another new thing we are creating are Hand-Sewing Kits. 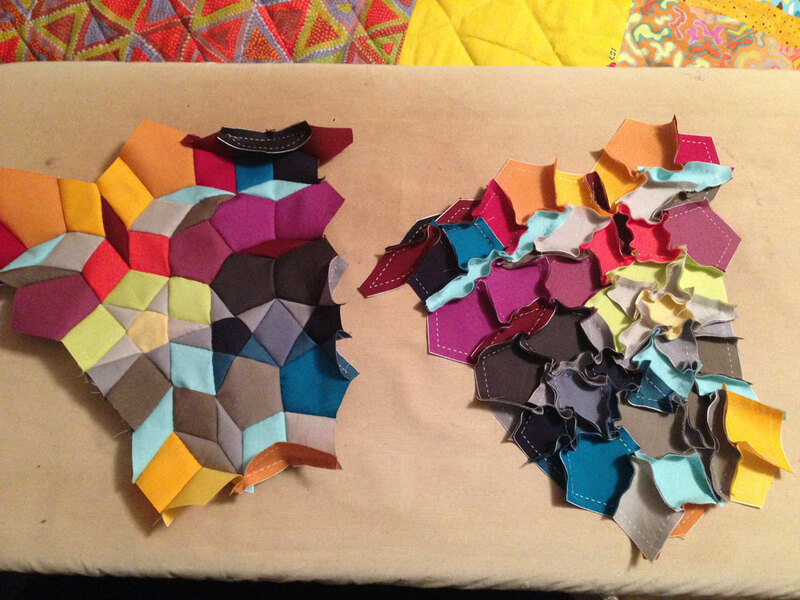 NEPP (Not English Paper Pieced) is what I’m calling them. 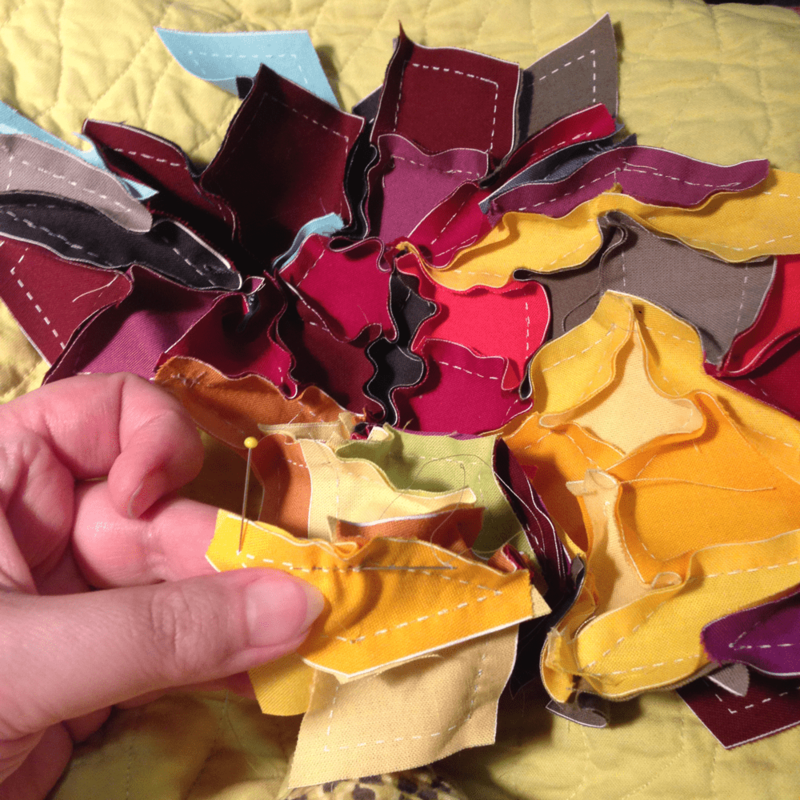 I’ve been working on my own hand-sewing projects for years and I’ve usually used the EPP (English Paper Pieced) method. I had a big epiphany on my last project that I could print the stitch lines onto the back of fabric and use a running stitch to piece them together. 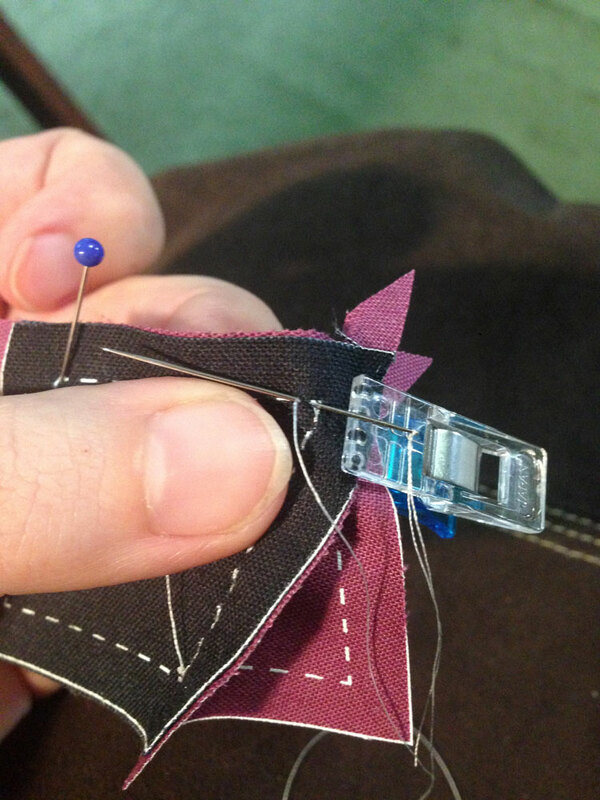 This saves a whole lot of time compared to EPP. When we first started thinking about this, we didn’t know how long the cutting would take (much longer than the printing!) but we think that the best thing about a kit is that you don’t have to do much extra other than sew. 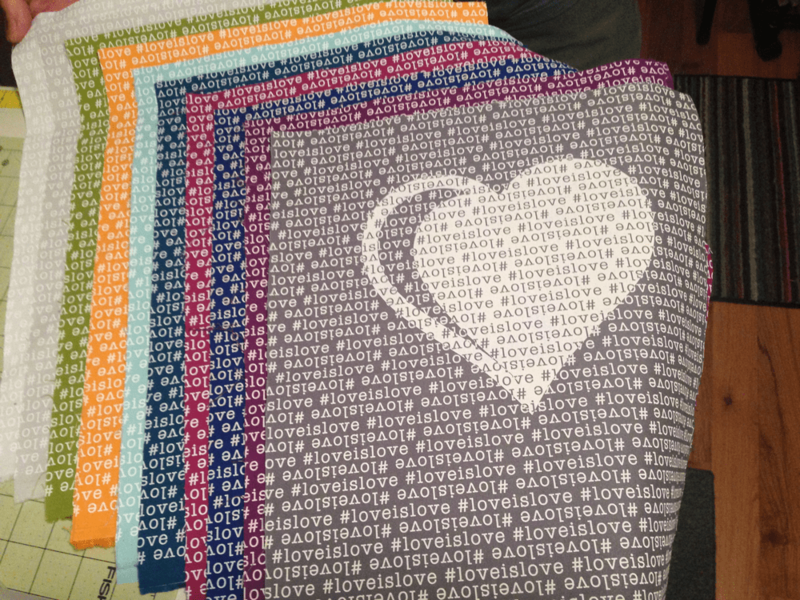 So… we will be doing all the cutting here so these kits will come ready to stitch together! If you’ve ever made an EPP project yourself, you would understand the value of this in time conservation! I also wanted to make something that wasn’t too daunting so that a first-time hand sewist can try a very small project before jumping into something larger. Myrtle NEPP Pattern Layout – each kit has it’s own colors. 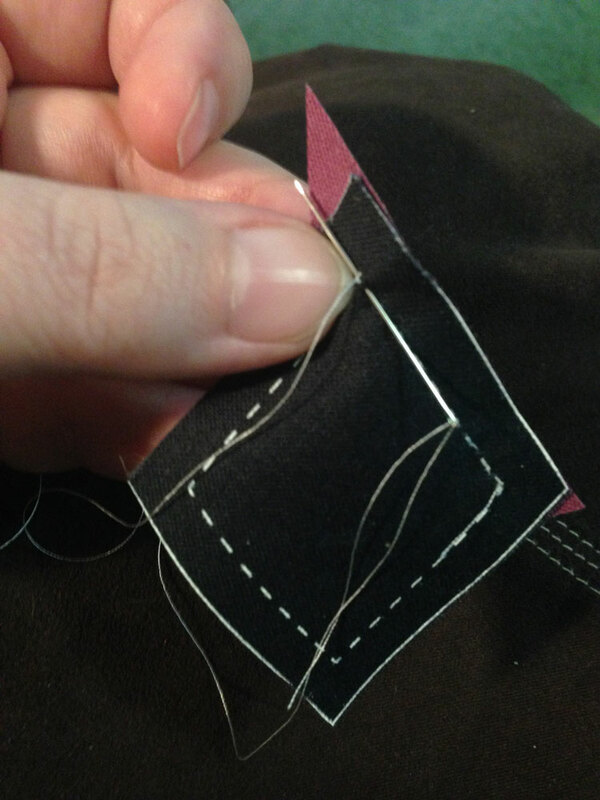 Hand stitching using a running stitch and knotting at each corner. Our online store will be opening 2/12/18 with these items plus T-shirts and Hoodies, of course. 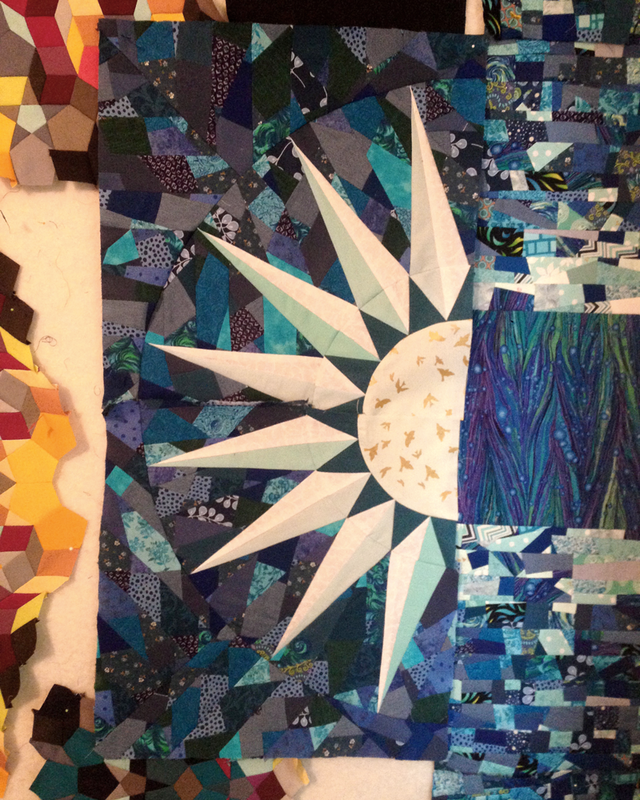 We are starting to connect with other designers for quilt-related designs that we can feature on our site. This is fantastic because we love to work with other artists – it will also keeps things on our site fun and fresh! Our main business is printing commercially for other groups and businesses, this is a brand new venture since it’s retail oriented. I’m very excited to start this new adventure…and I’m ready to be successful at it! You will notice a new tab in the menu for our online store ChickenScratch – next February, it will be open and ready to use!